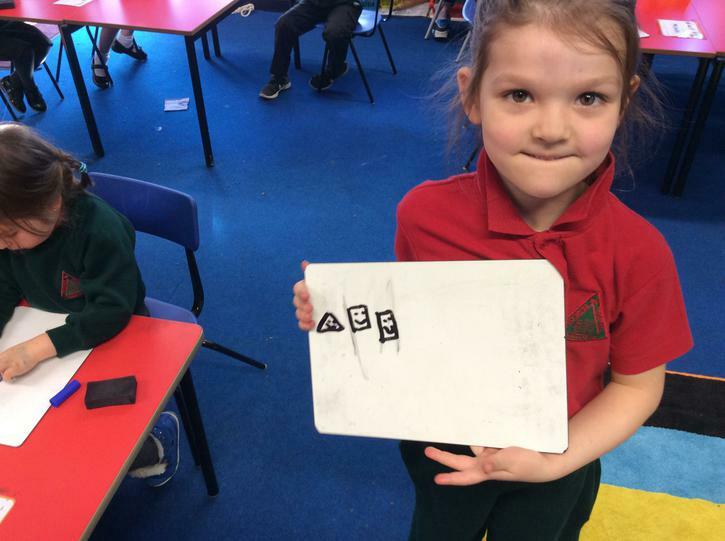 Look at the fantastic handwriting and sentences P1 have been composing! 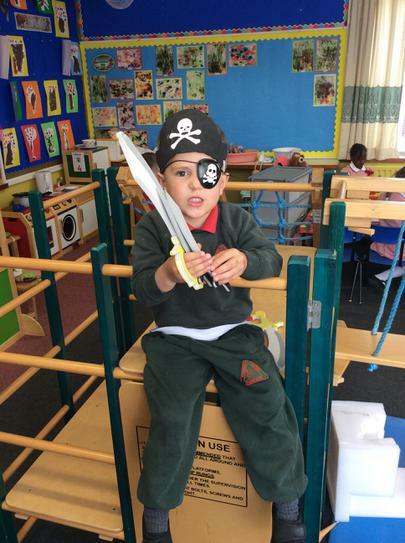 We have been thinking about Pirates this week and brainstormed some words to describe them. 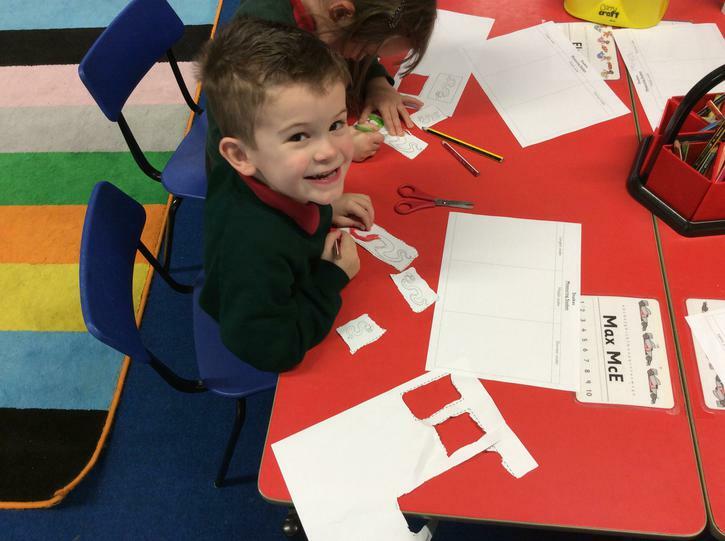 The boys and girls used some of these key words to form their own sentences. 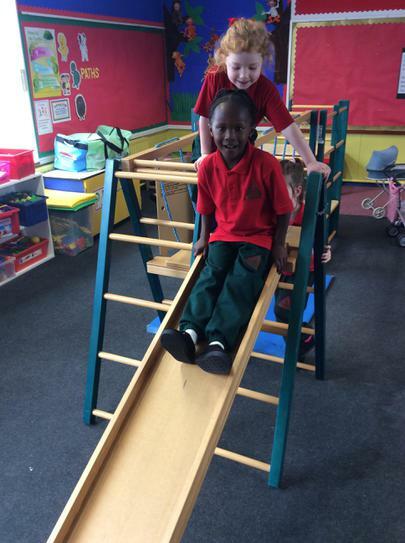 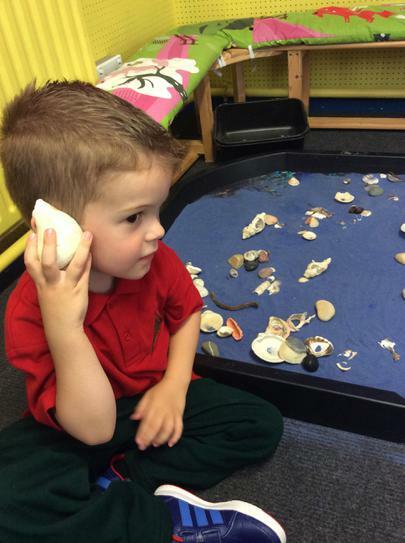 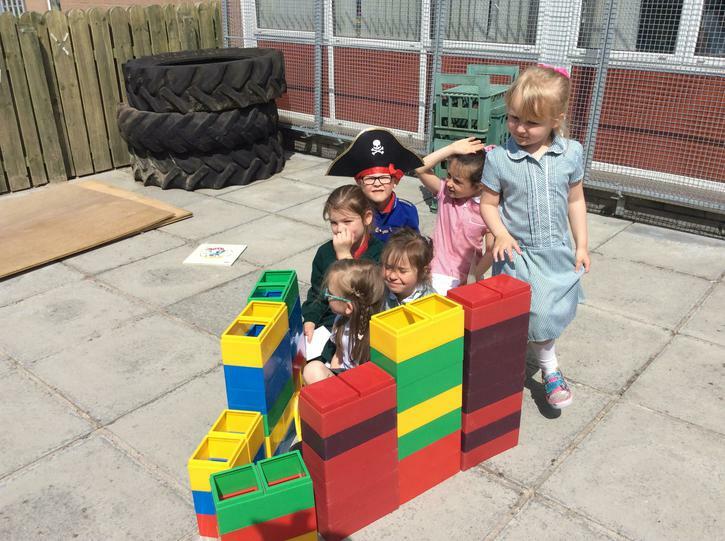 Primary One have been learning about Pirates. 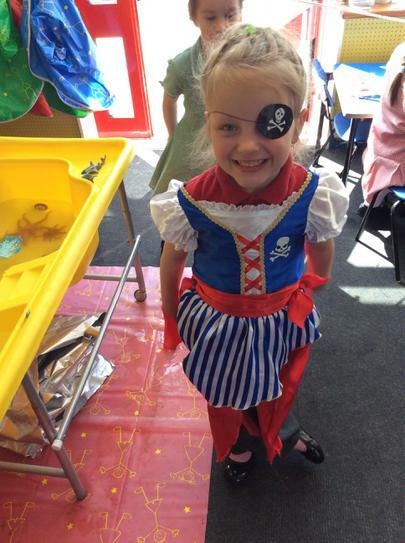 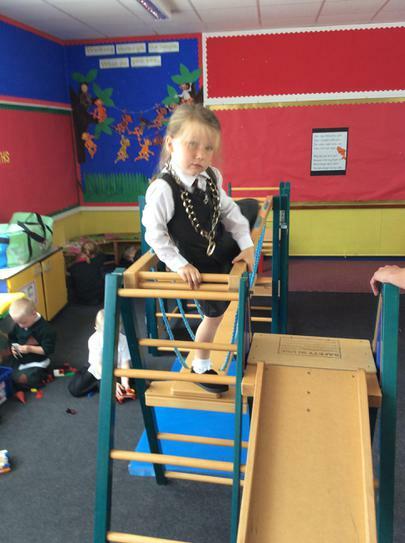 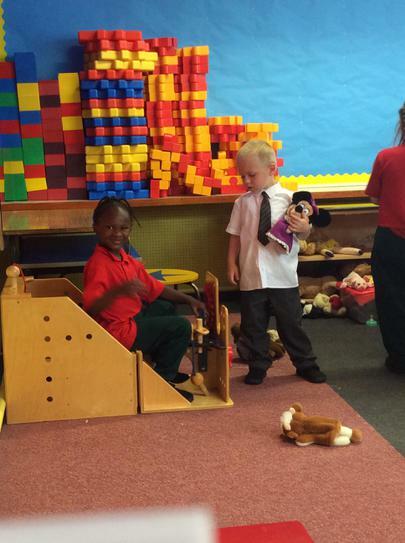 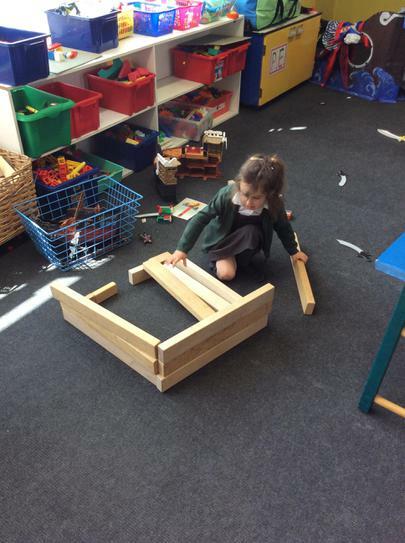 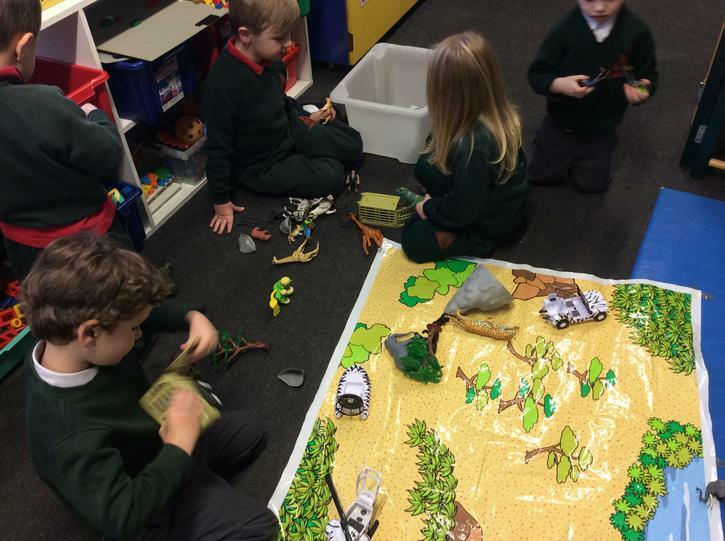 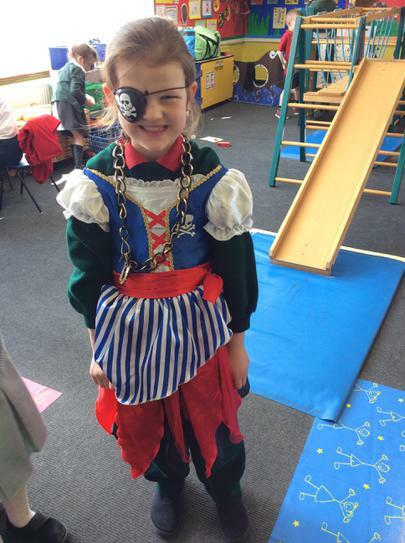 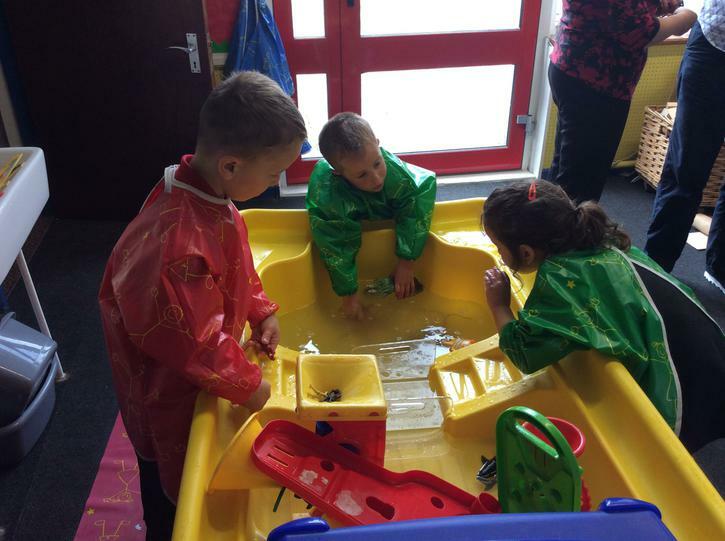 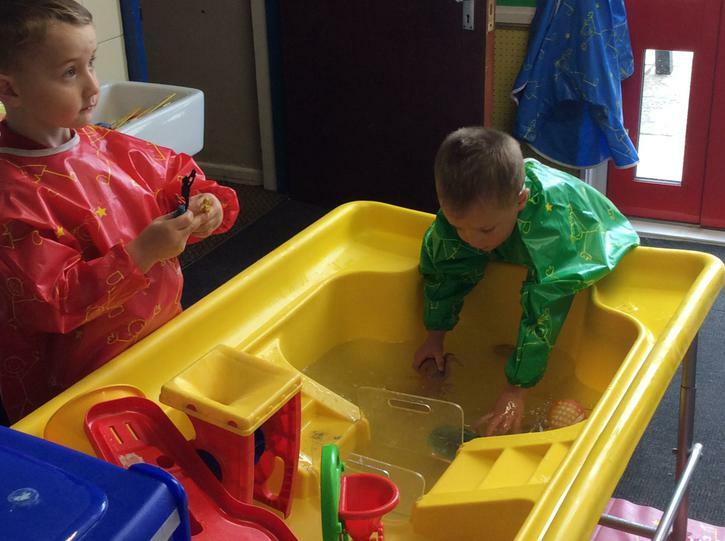 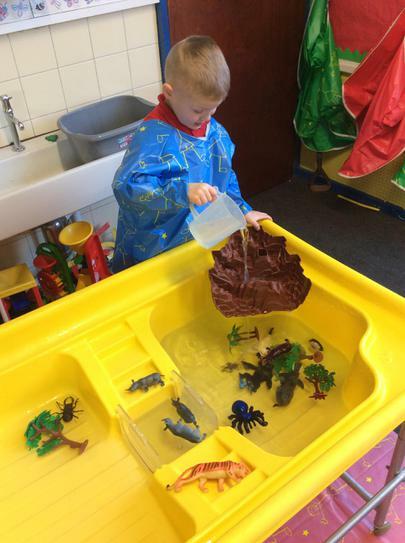 We have been looking at treasure maps, building ships and dressing up as pirates during Play Based Learning. 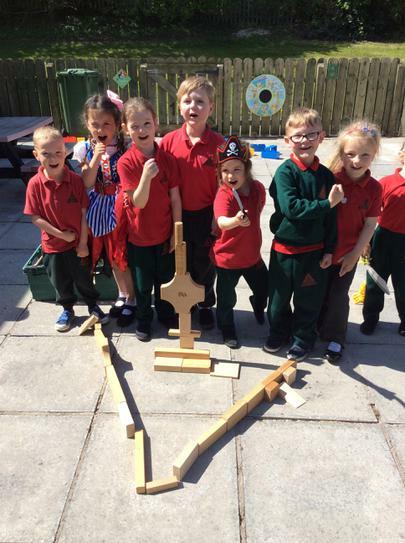 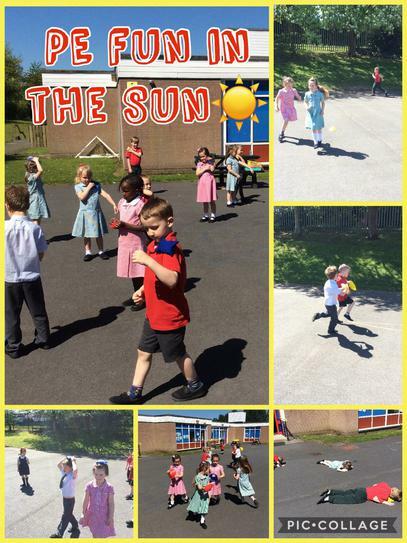 The sun has been shining over Drumgor Primary and we have been outside making the most of the lovely weather. 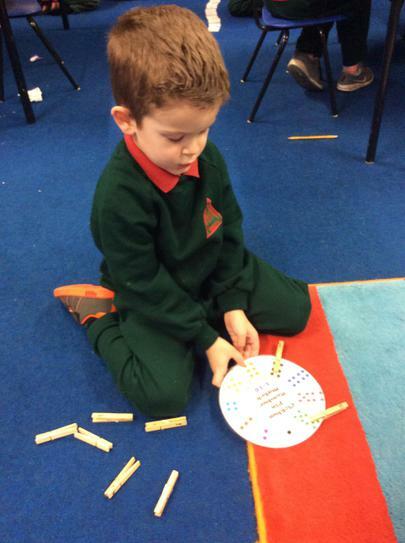 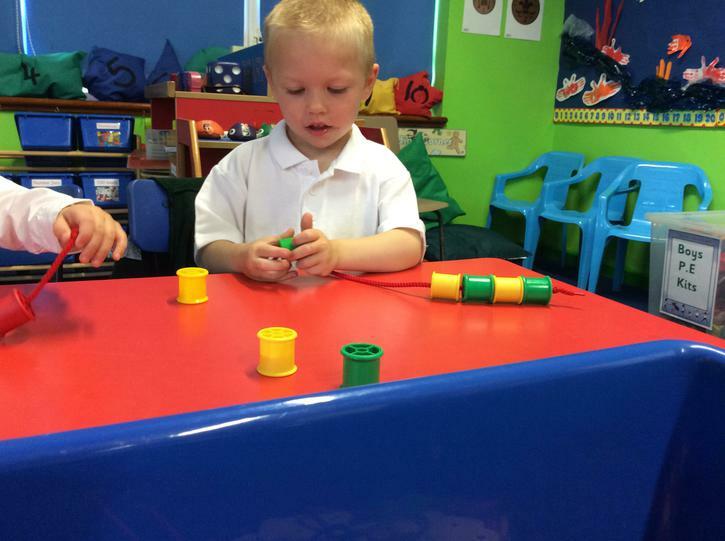 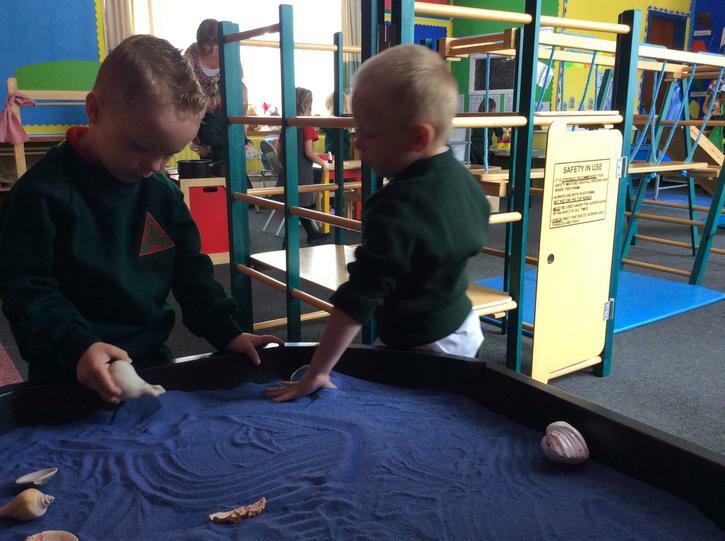 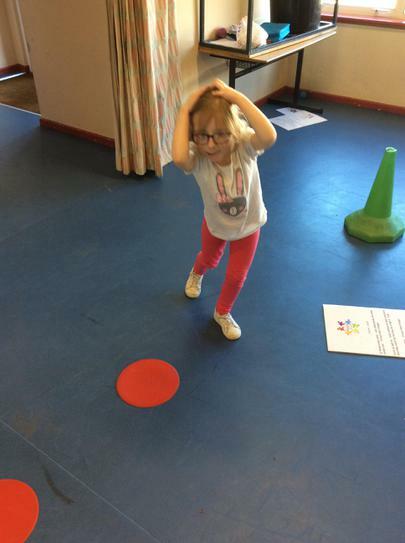 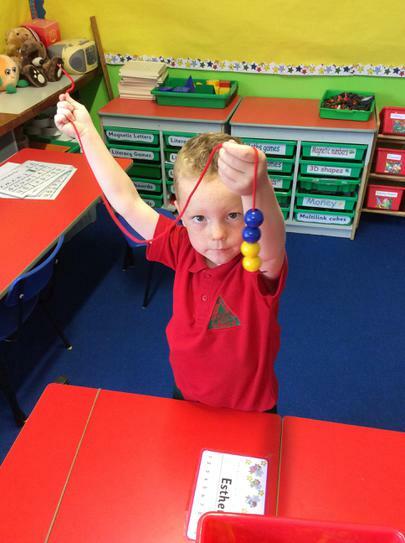 We have been working on balance, coordination and developing our listening skills. 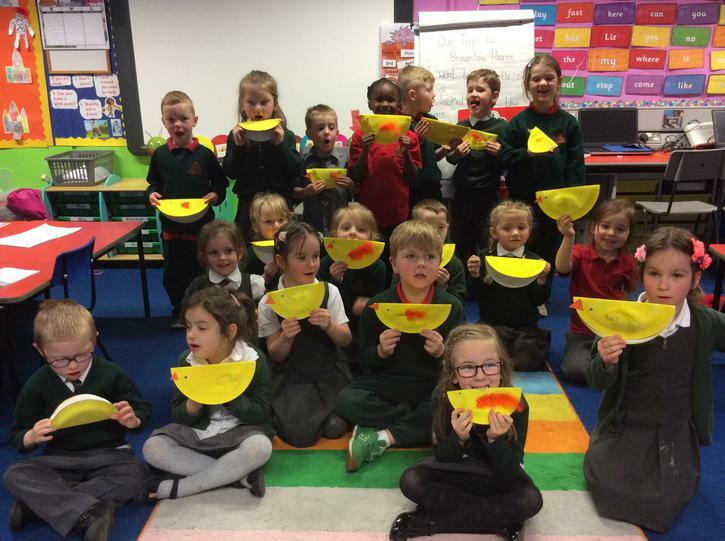 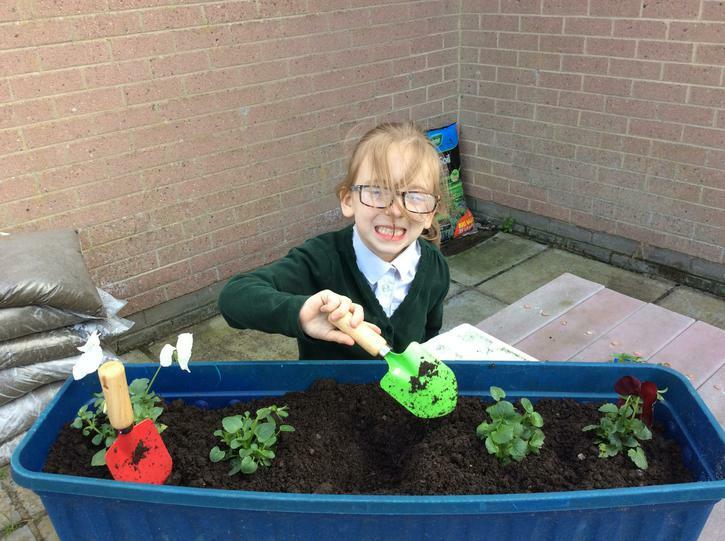 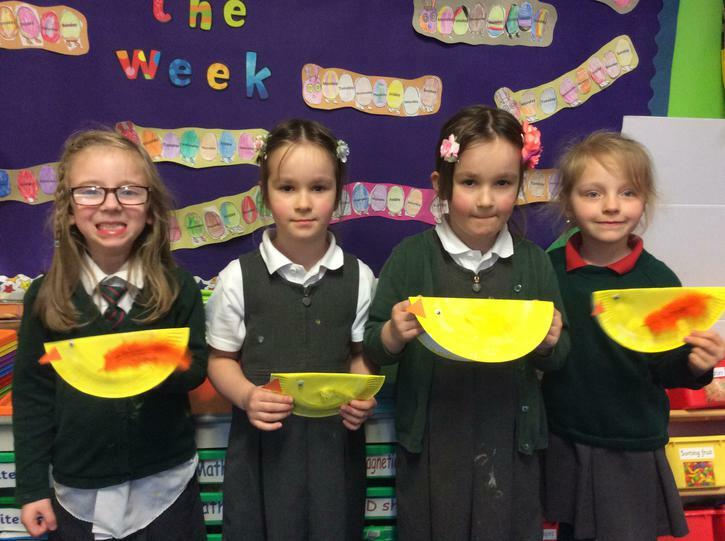 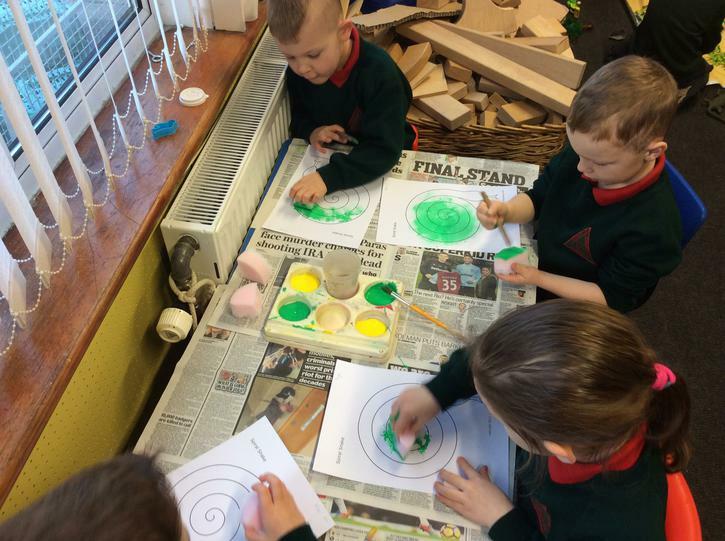 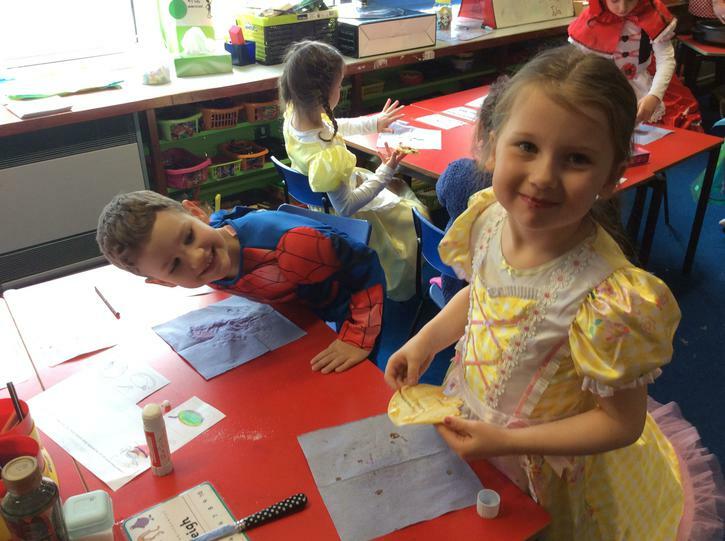 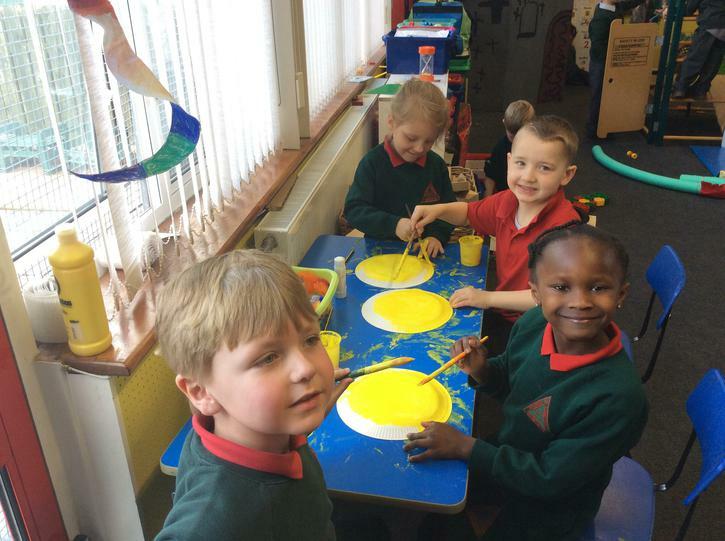 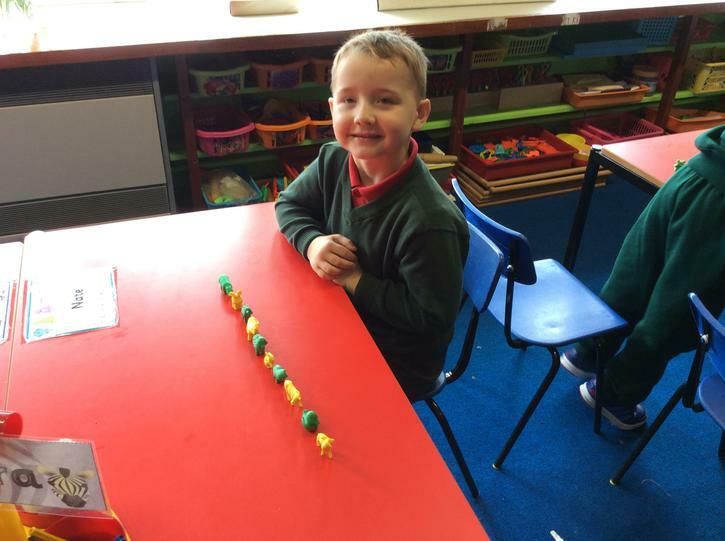 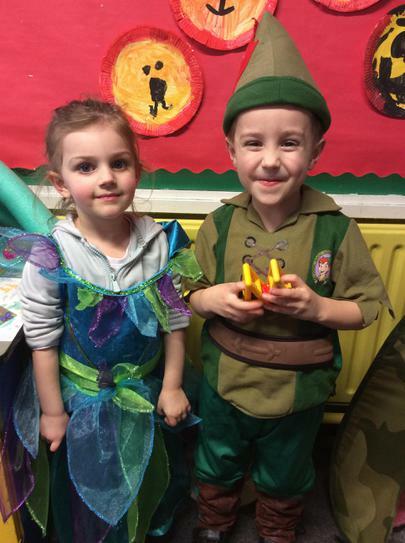 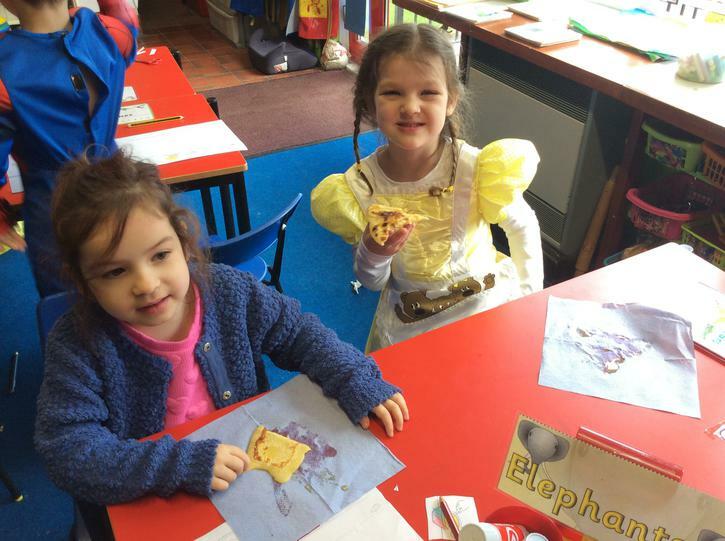 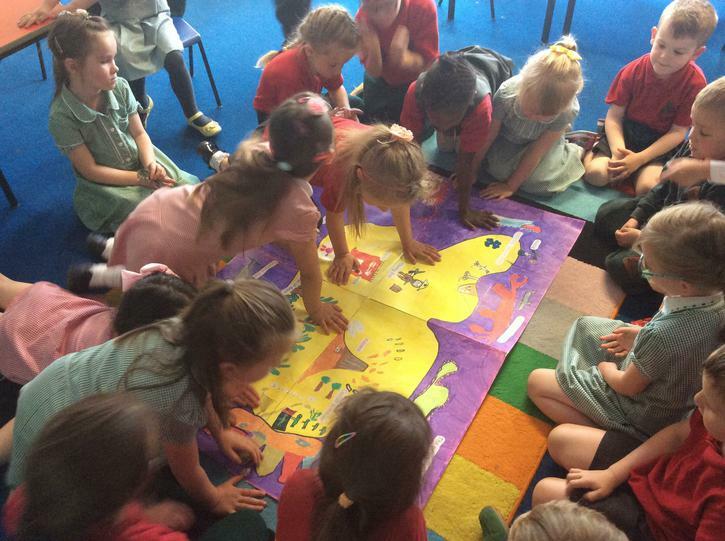 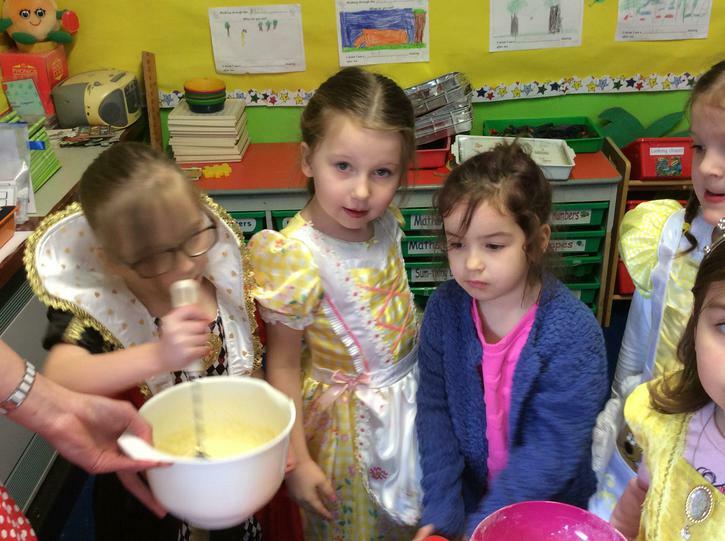 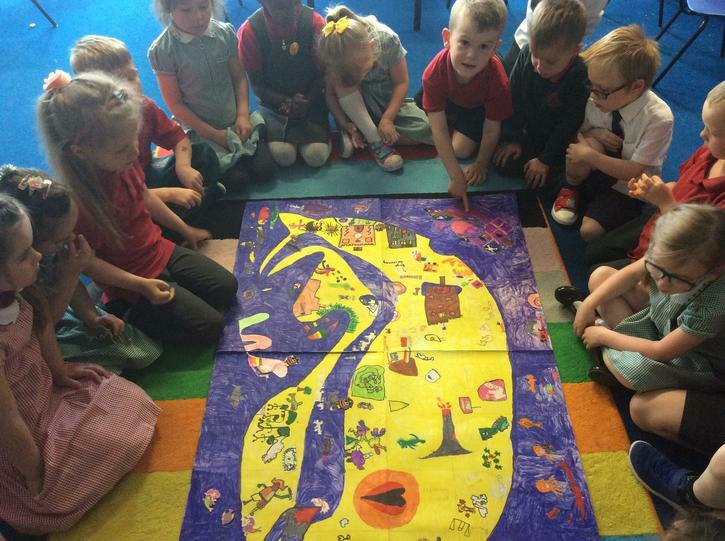 Primary 1 have been celebrating Easter and Spring by hearing the Easter story, making Easter crafts and hearing stories about the Easter bunny. 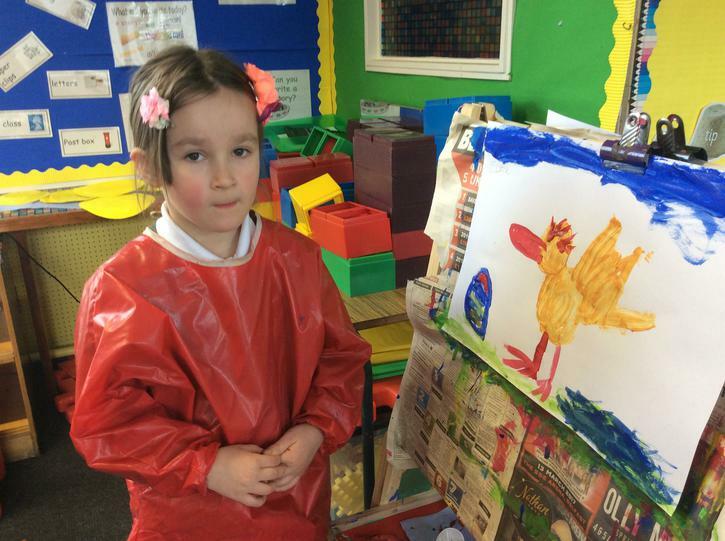 Here are some lovely Spring chicks that we made! 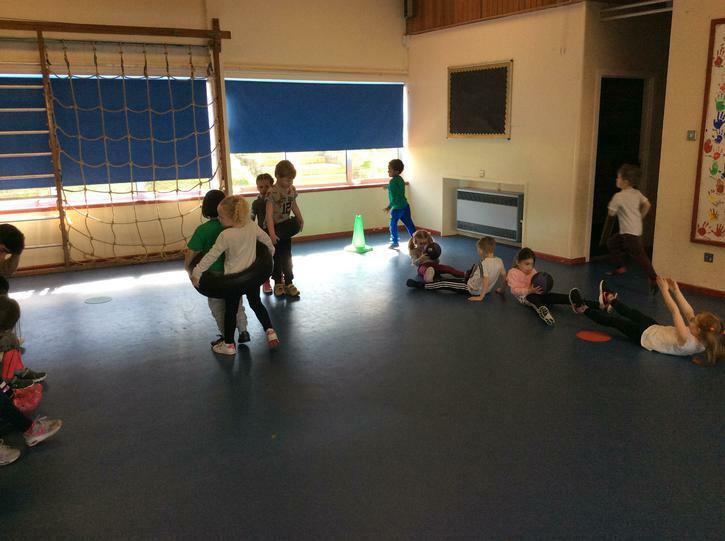 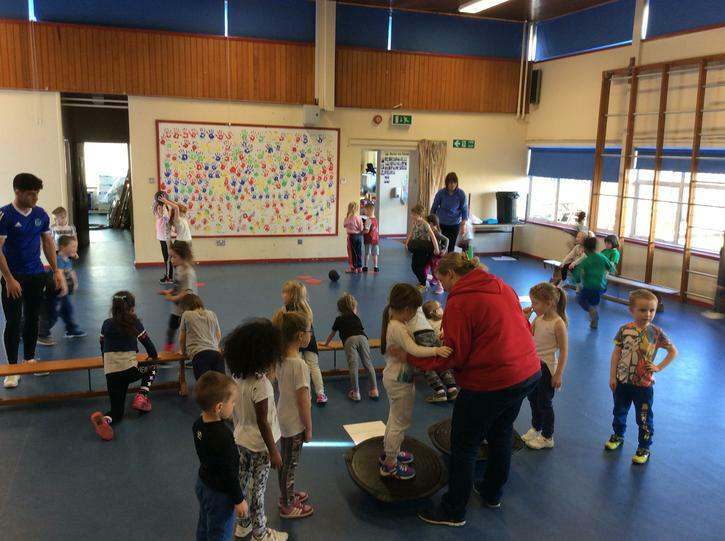 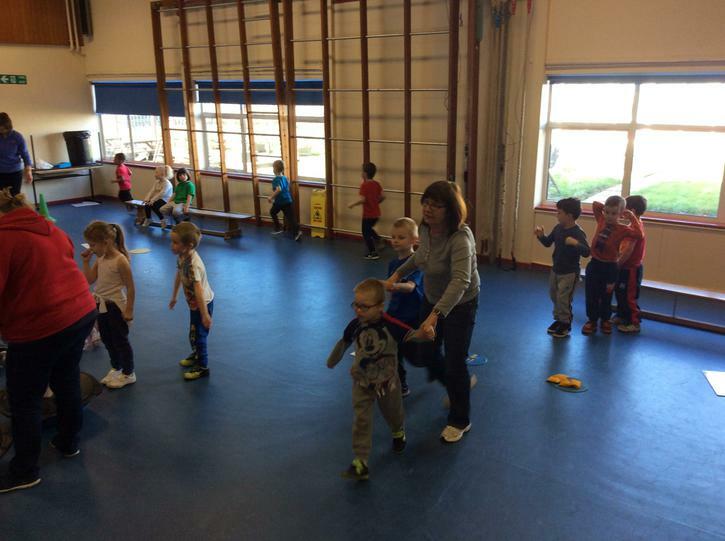 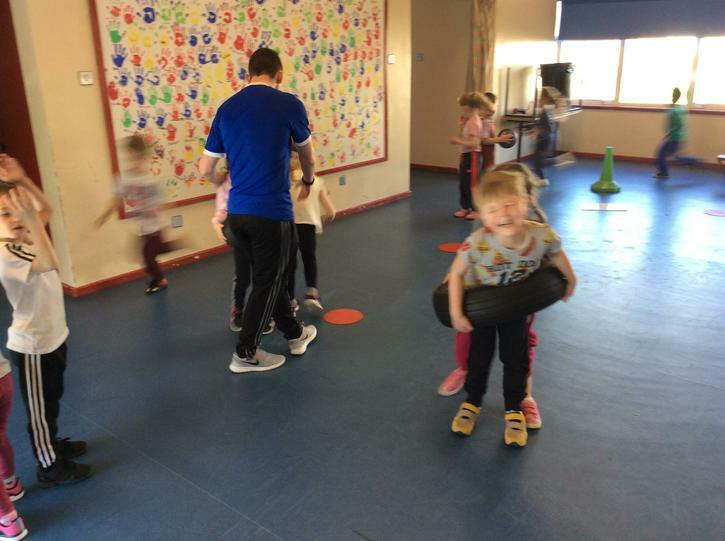 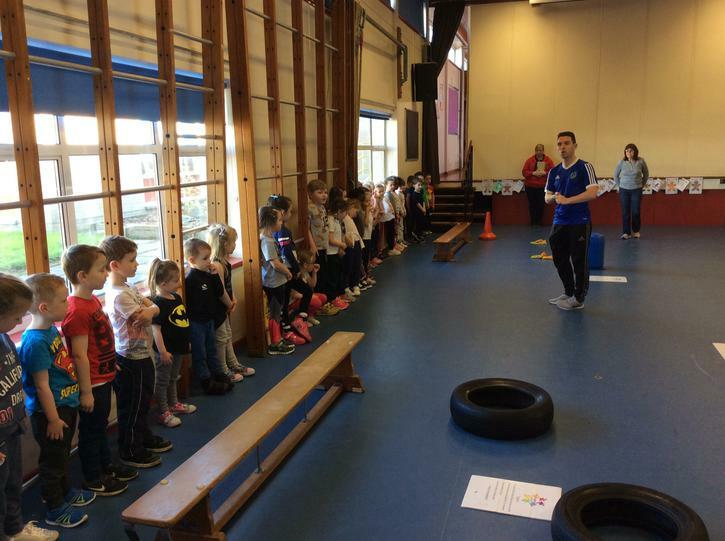 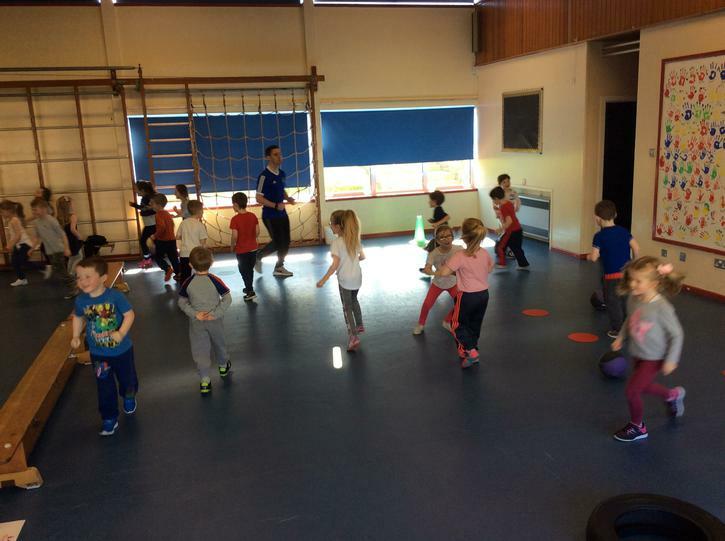 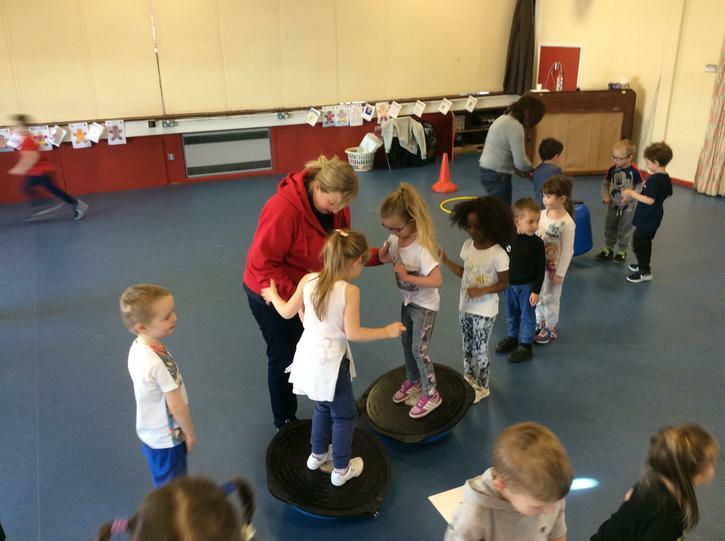 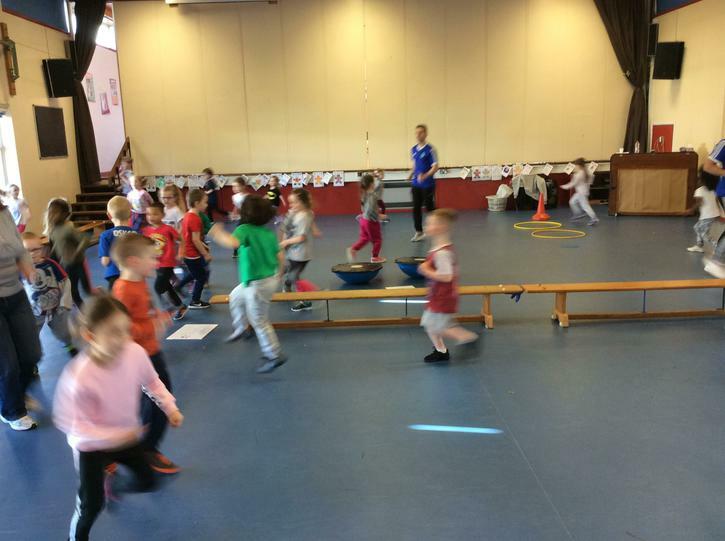 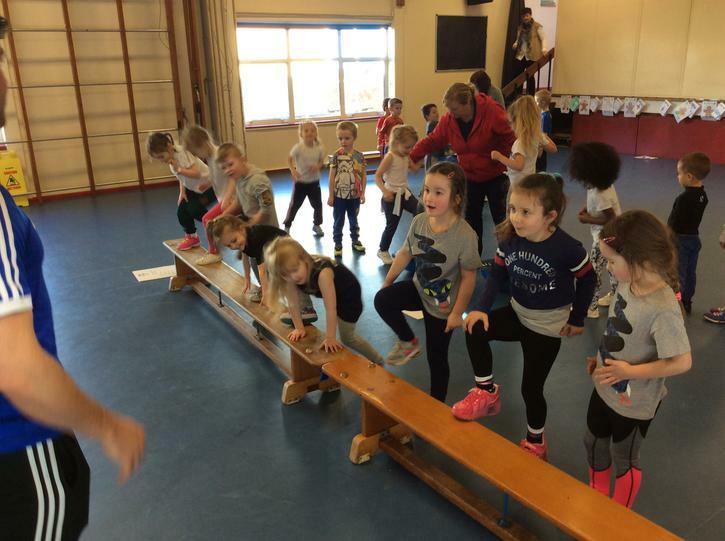 Primary 1 were feeling very energetic this week when they took part in Buddy's Big Workout for the NSPCC. 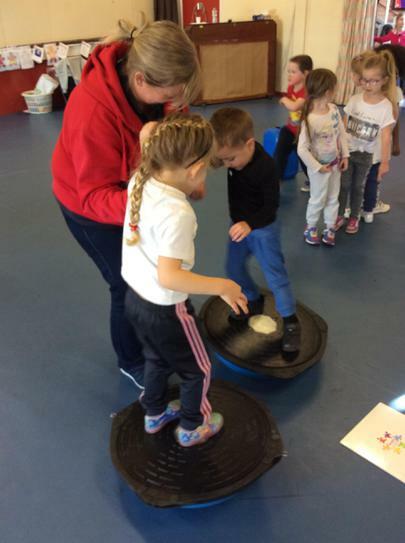 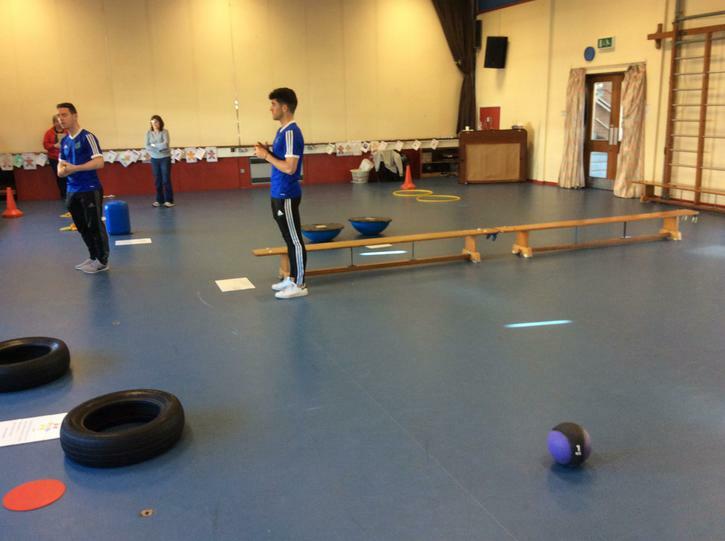 The team from Healthy Kids took the boys and girls for fun circuit and activities. 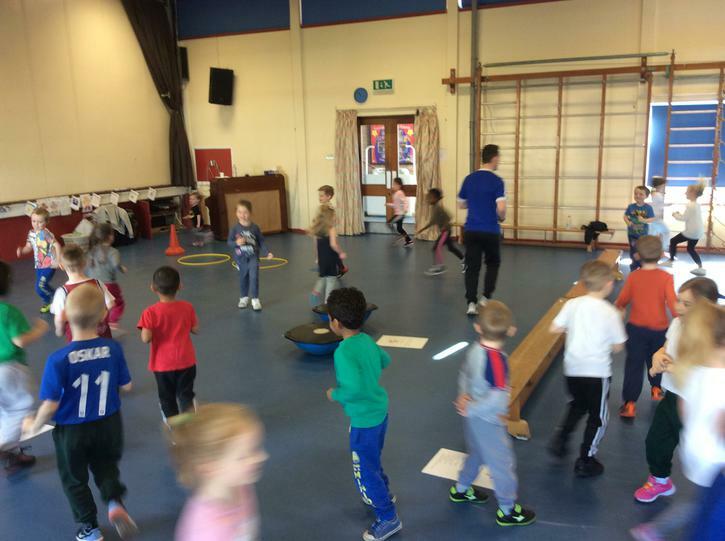 We balanced, ran, carried and crawled with some great music to keep us moving. 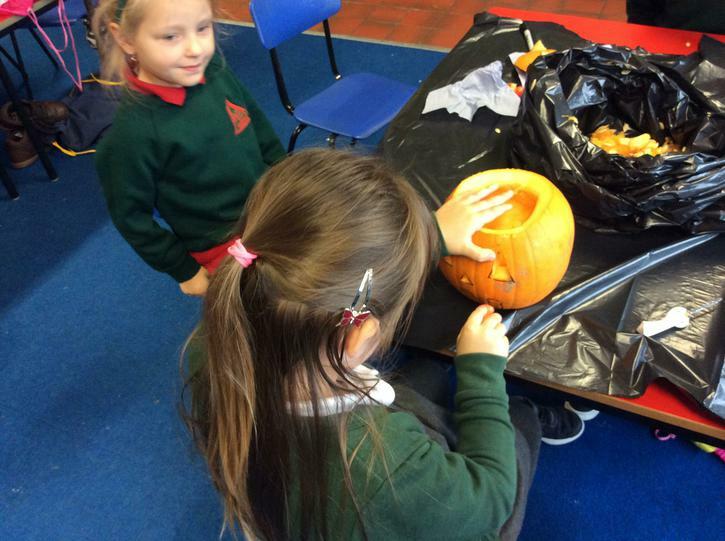 Have a look at our snaps from the day! 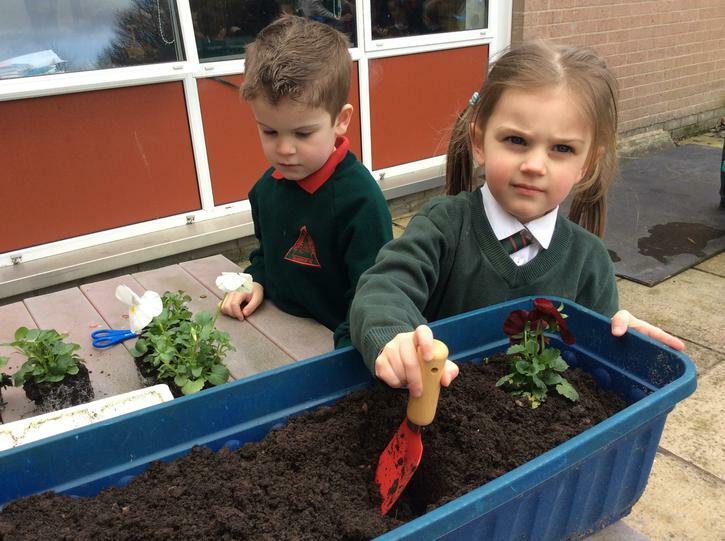 area by planting some pansies in the flower boxes. 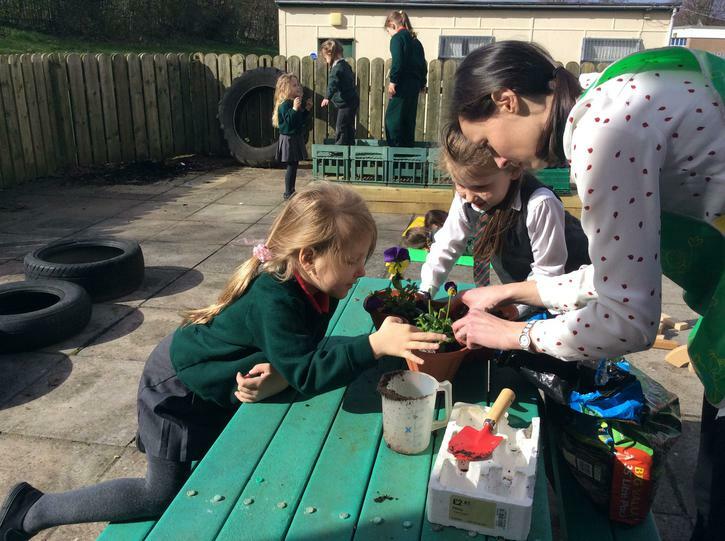 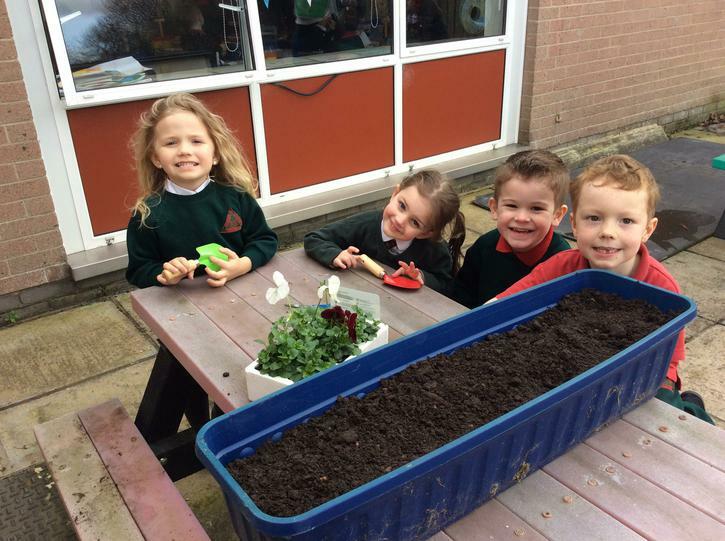 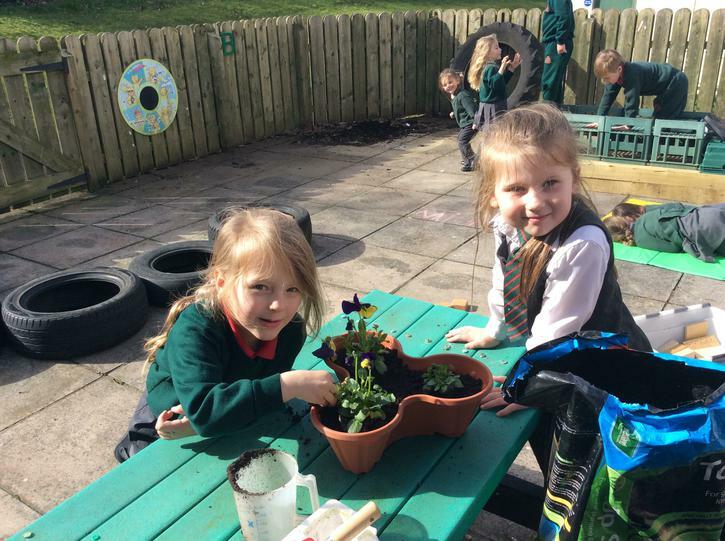 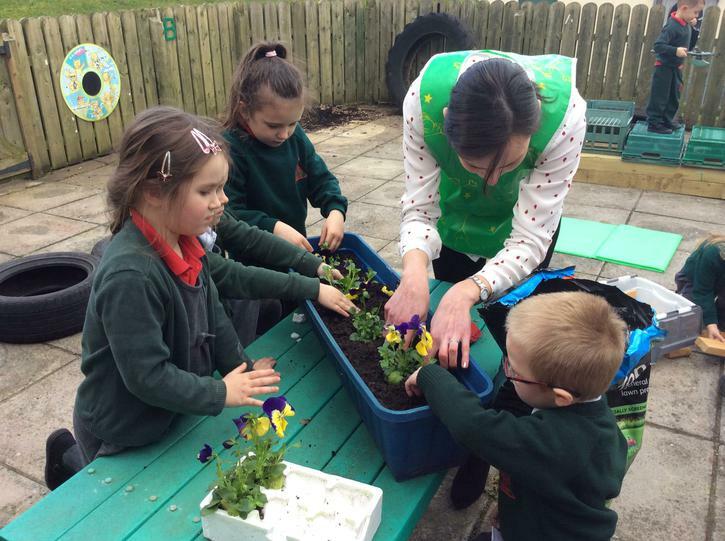 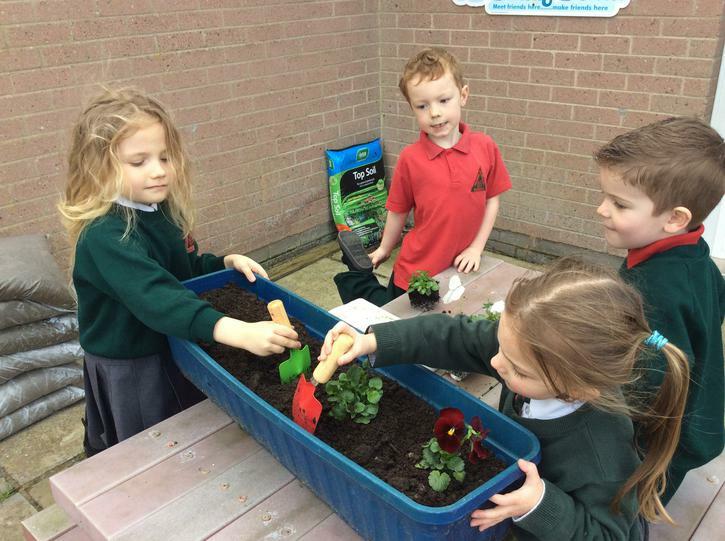 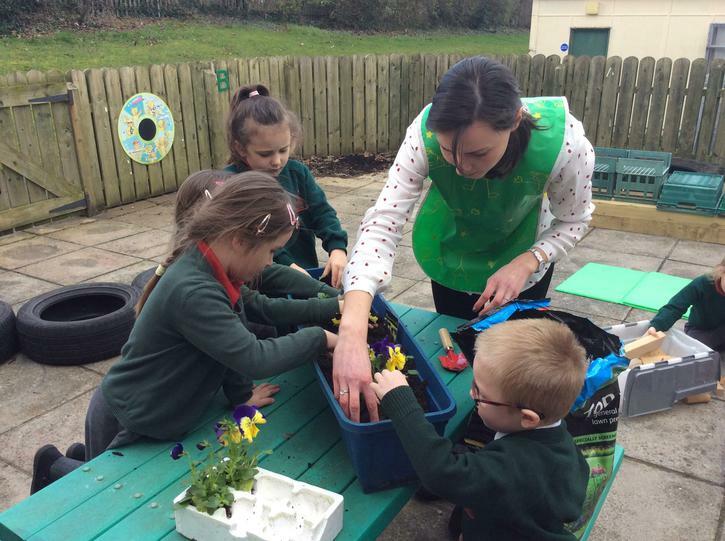 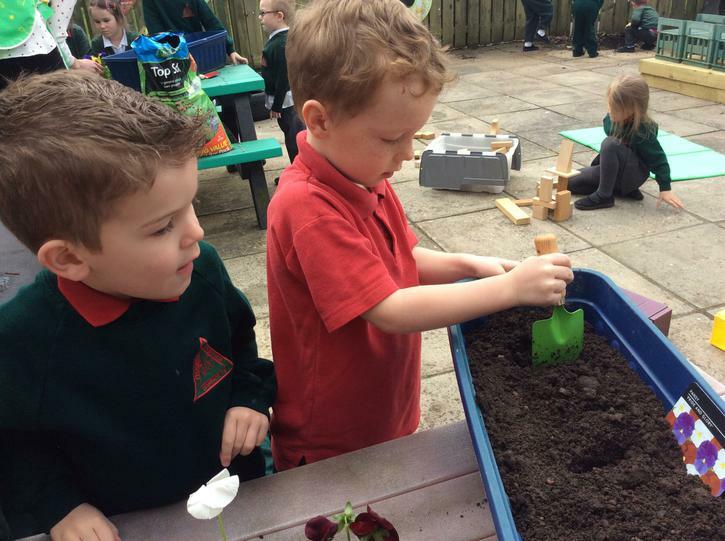 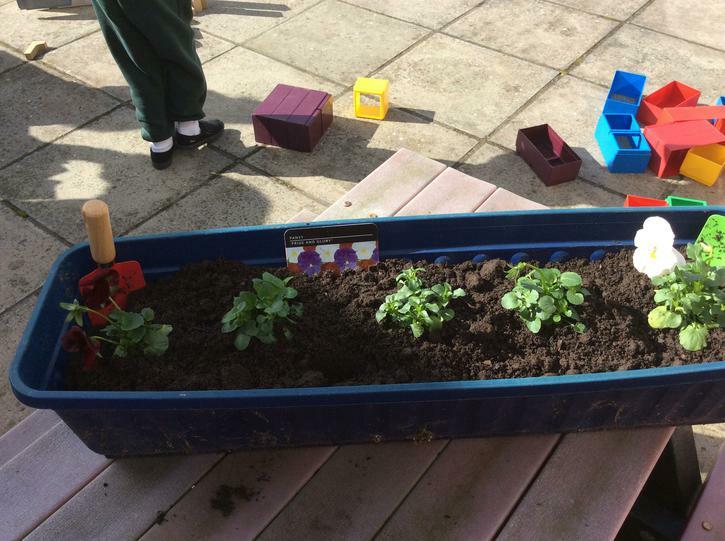 We chatted about the things plants need to grow and have been watching them closely to make sure they are well looked after. 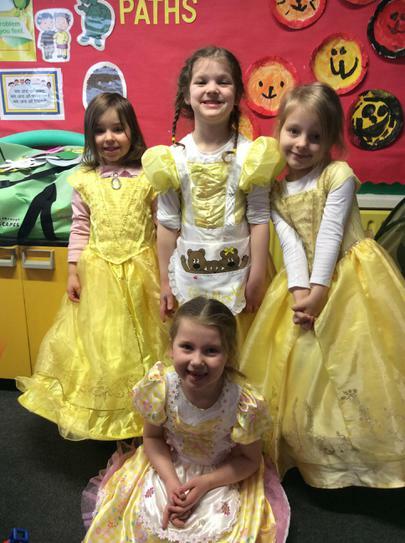 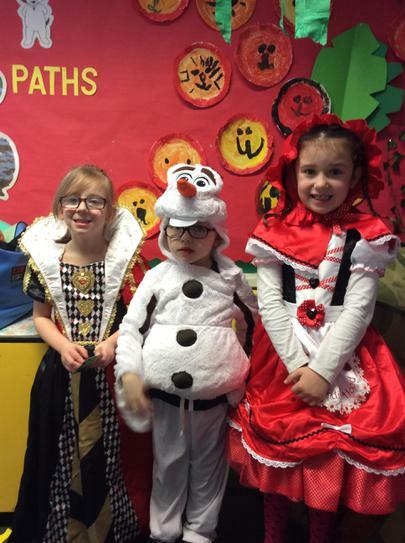 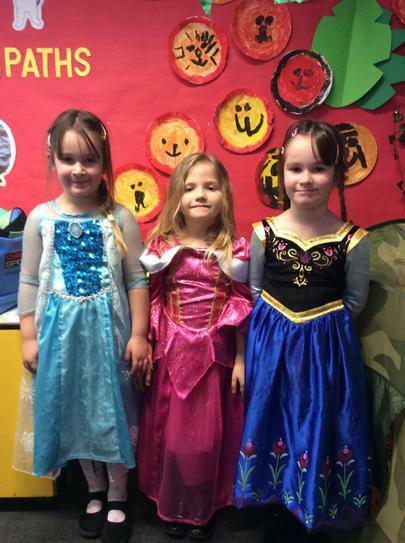 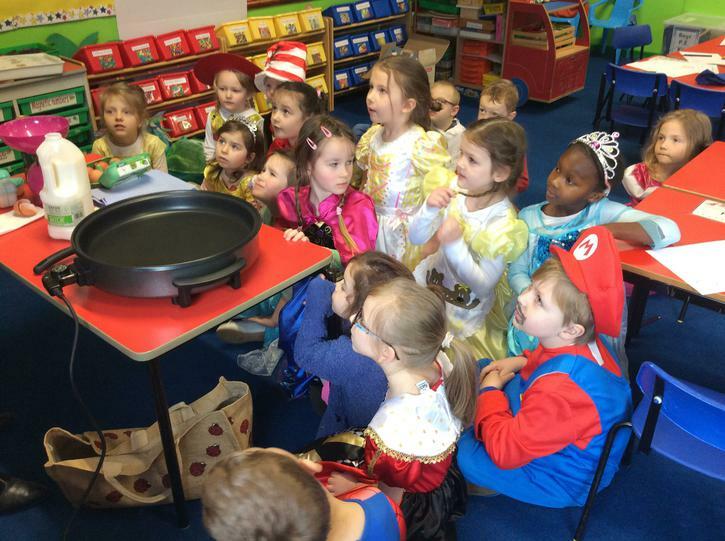 Look at all our wonderful costumes to celebrate World Book Day. 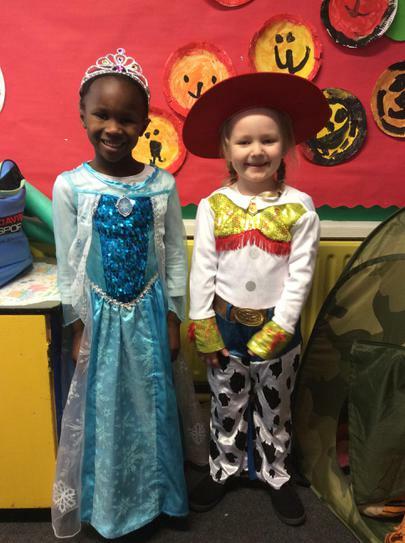 We brought in our favourite story and dressed up as characters from books. 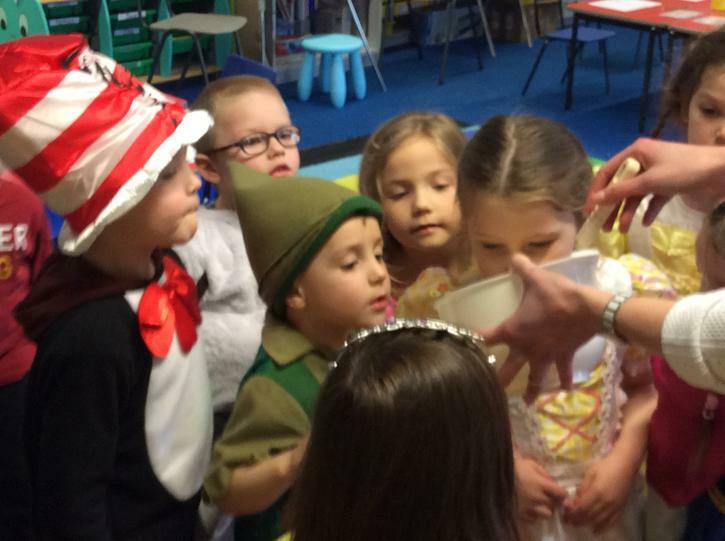 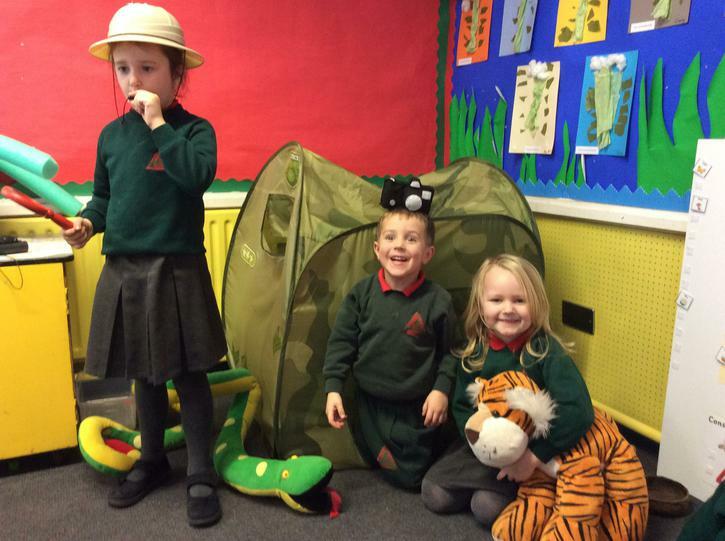 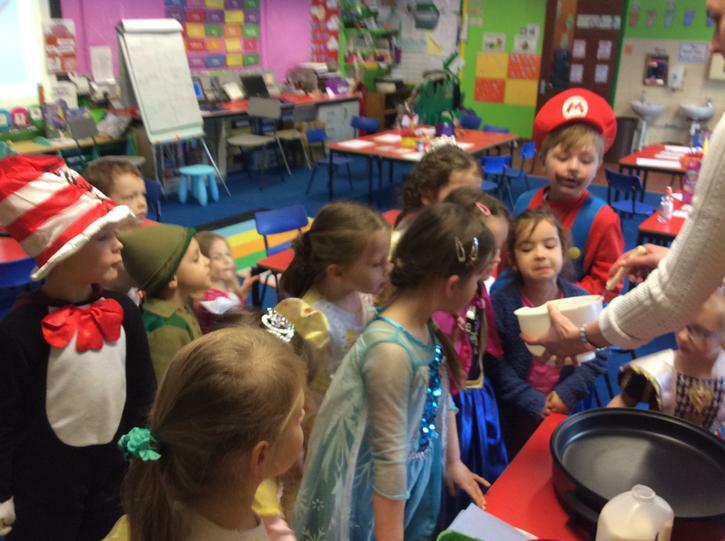 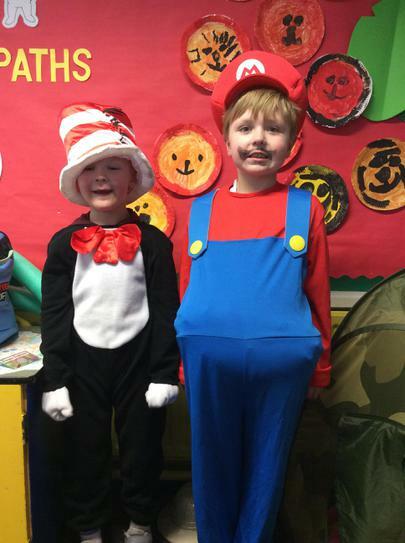 In our class we had The Cat in the Hat, Super Mario, Goldilocks, Little Red Riding Hood, Belle and Mr Bump. 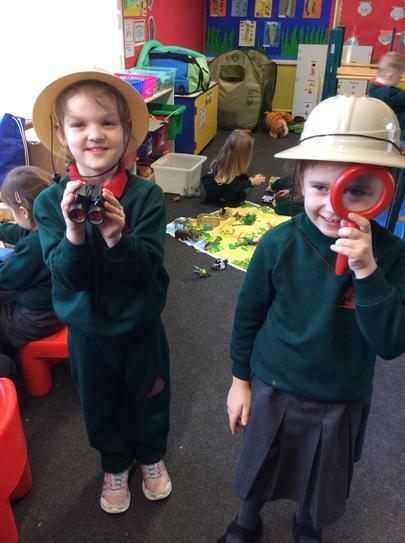 See if you can spot them! 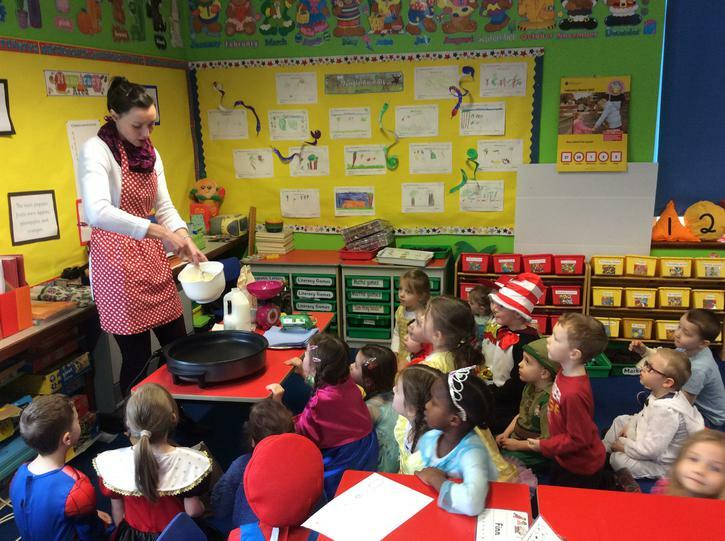 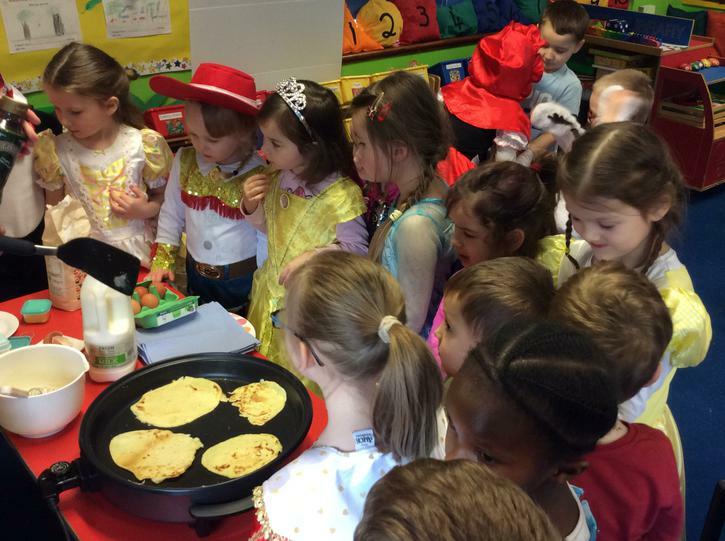 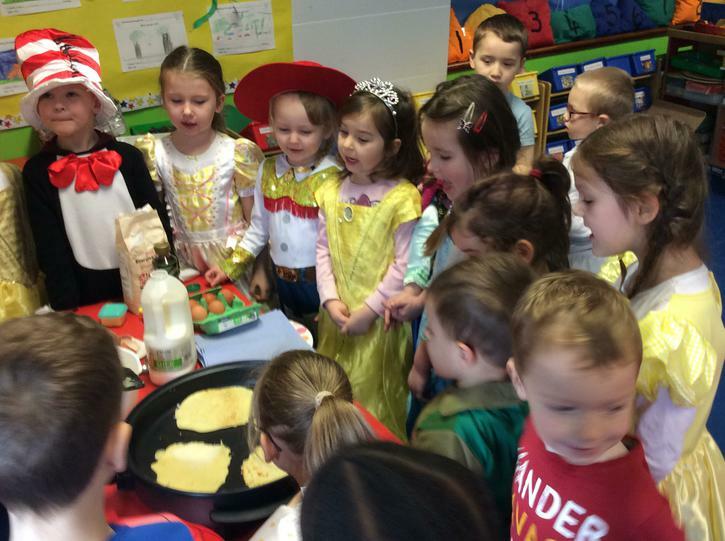 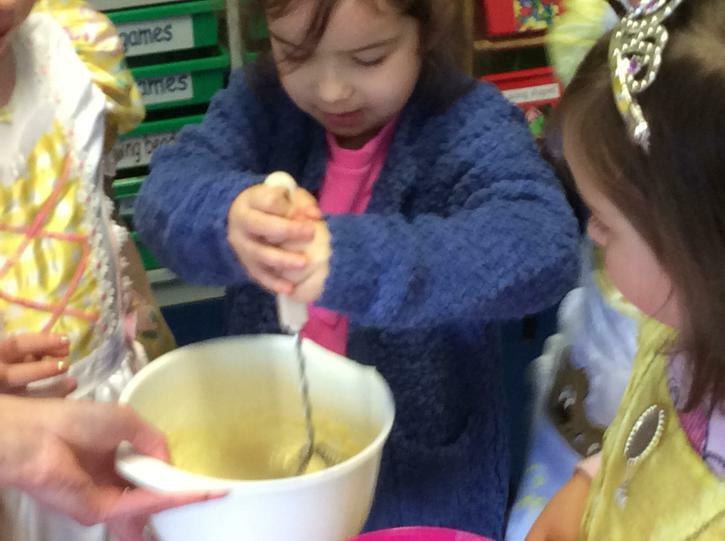 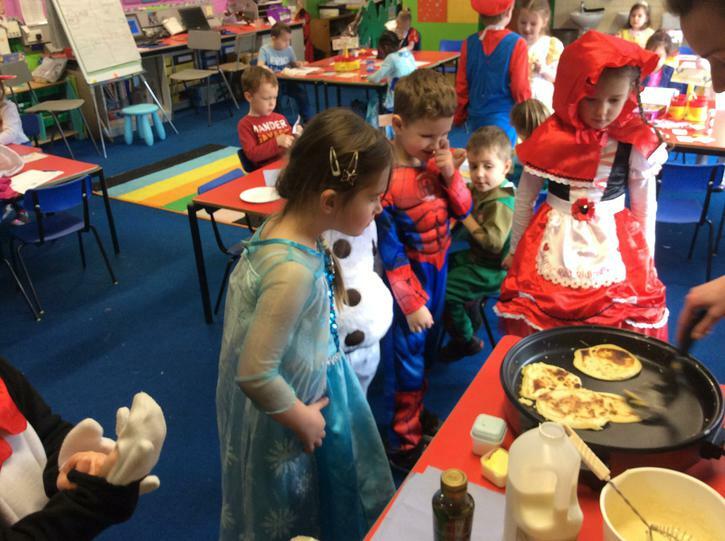 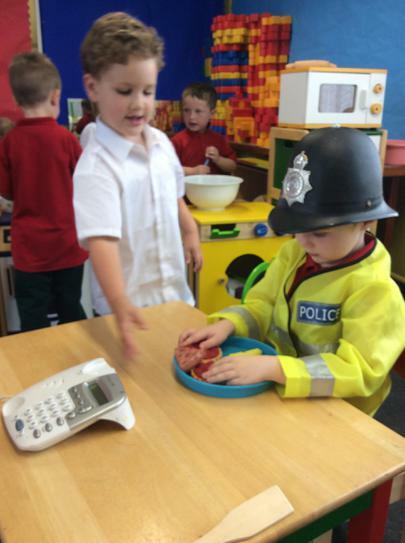 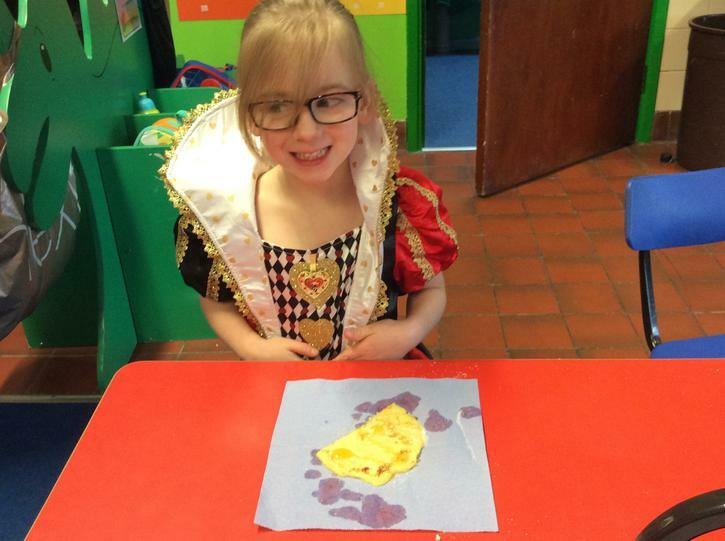 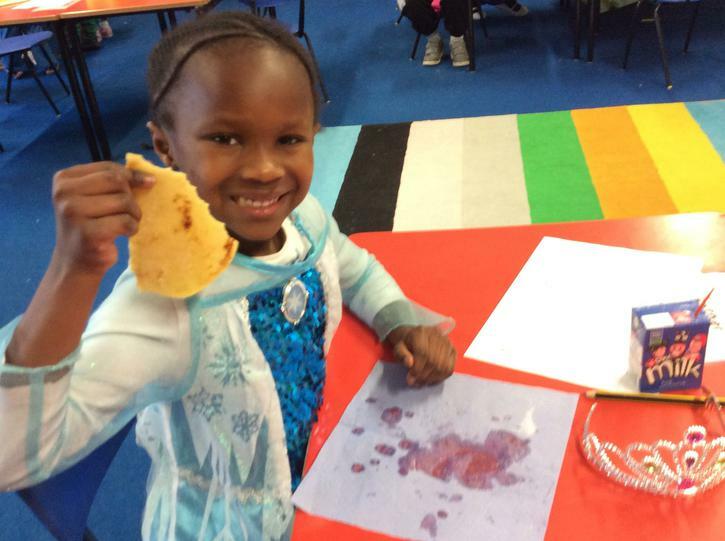 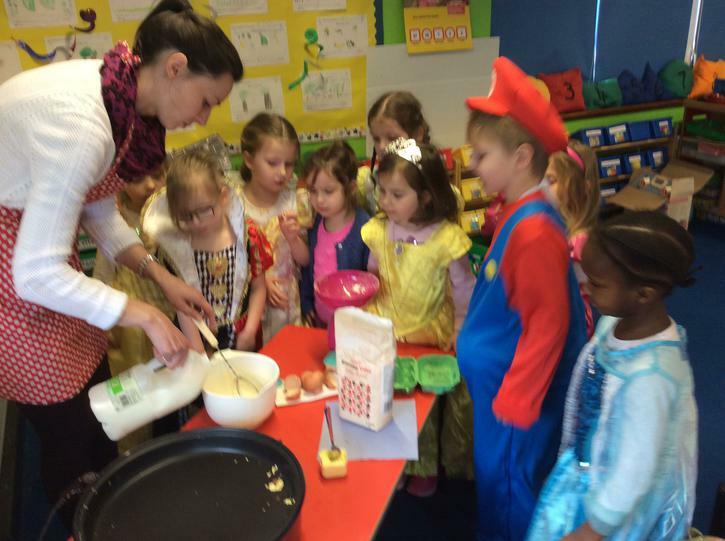 Lots of fun was had today making and eating pancakes. 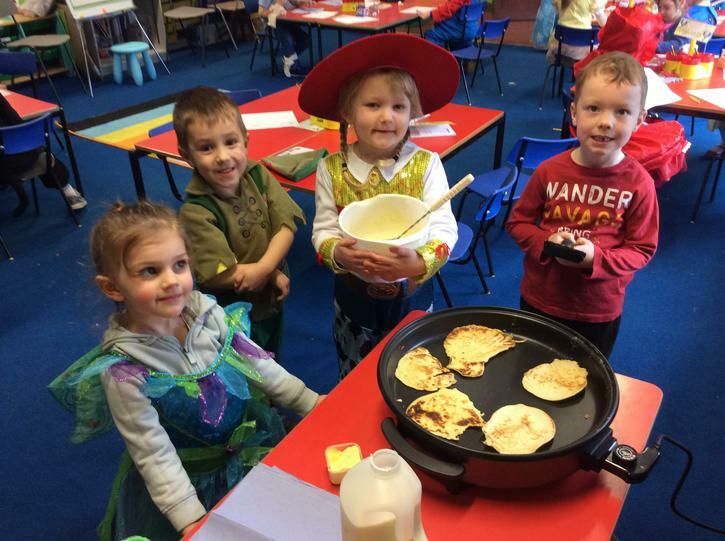 We looked at the history of Pancake Tuesday, the ingredients needed to make a pancake and the types of toppings people like to have on their pancakes. 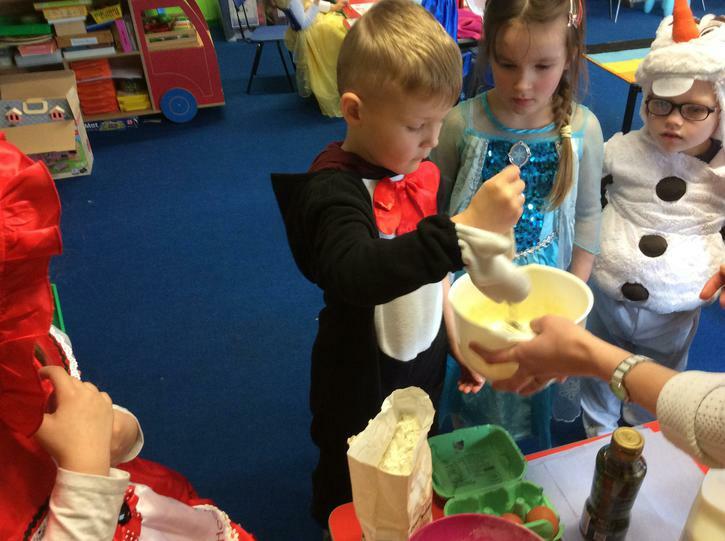 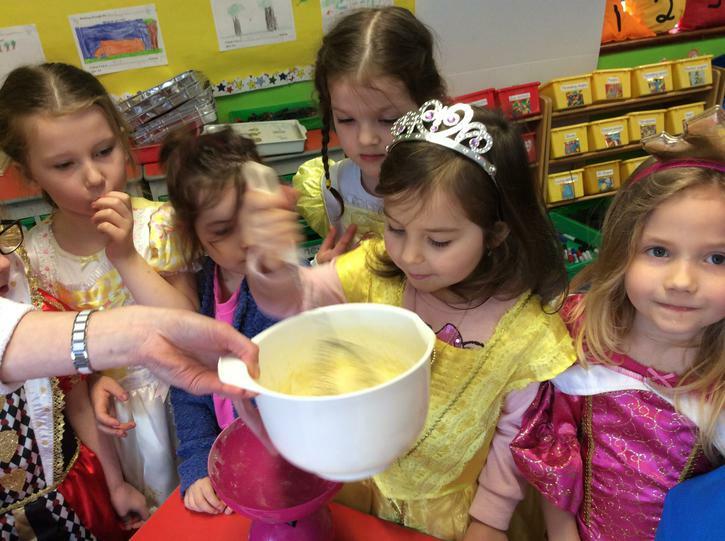 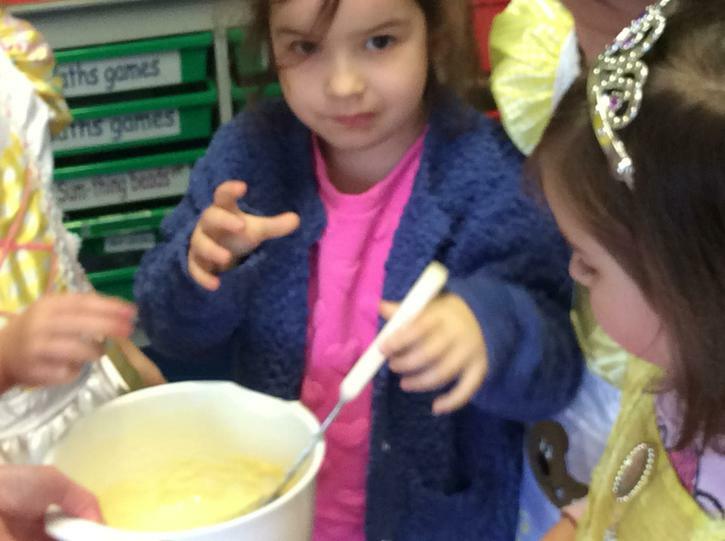 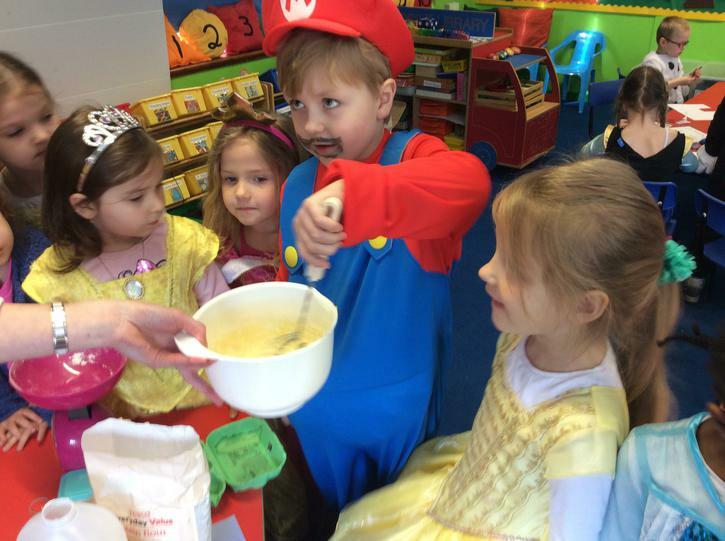 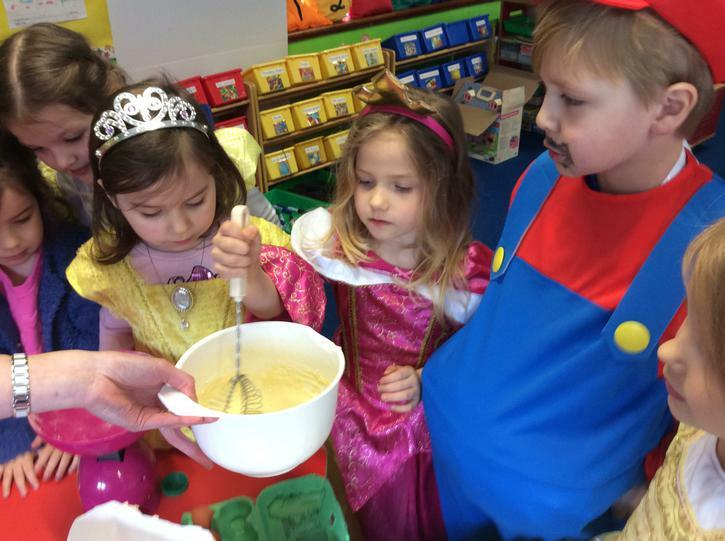 The boys and girls helped to mix the batter and were the official taste testers. 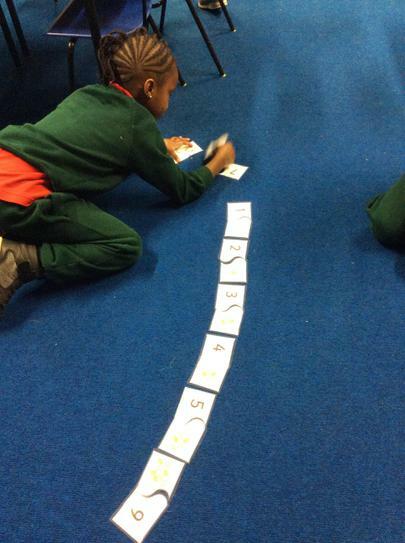 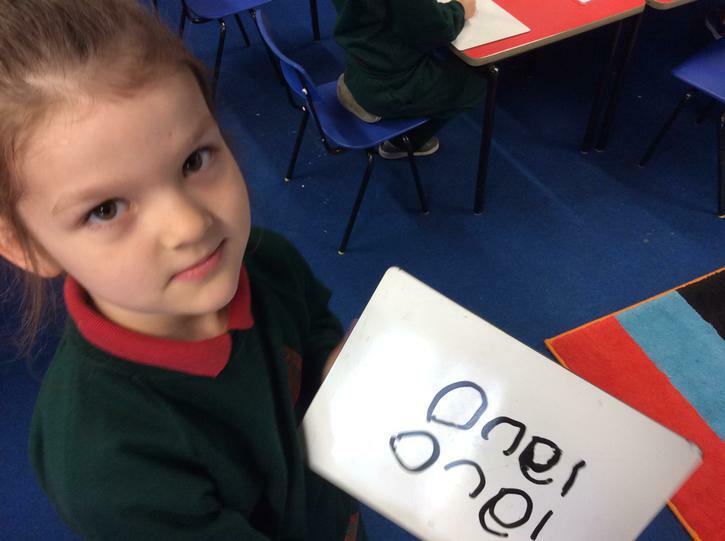 This term we have been working on our numbers up to 10. 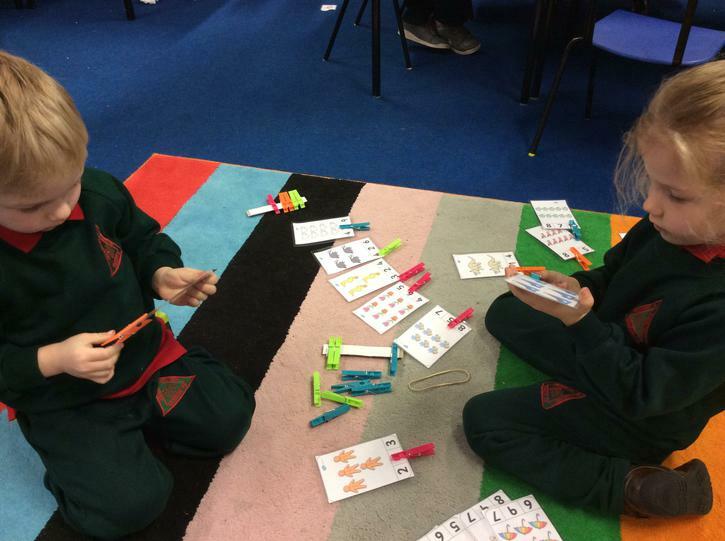 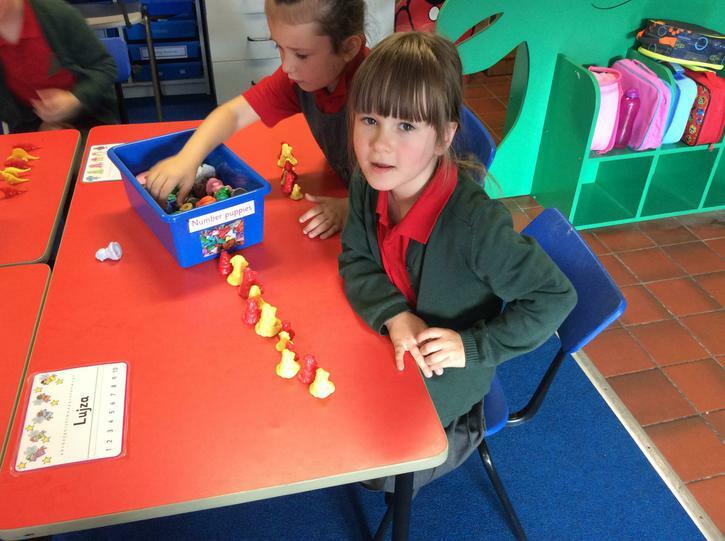 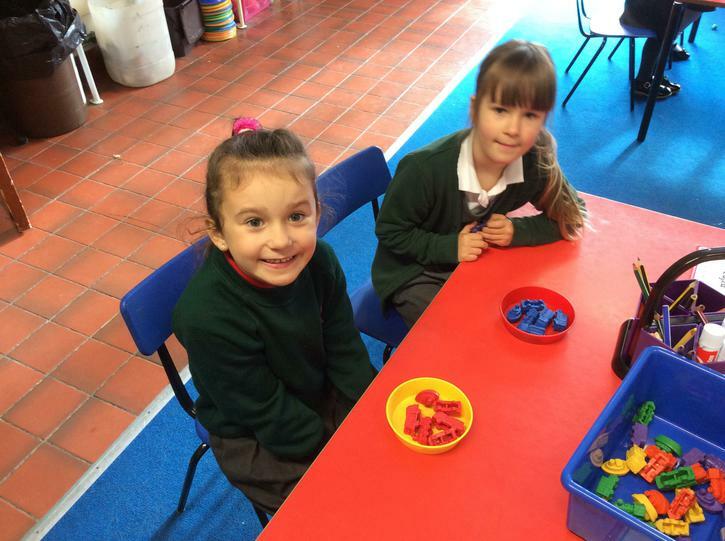 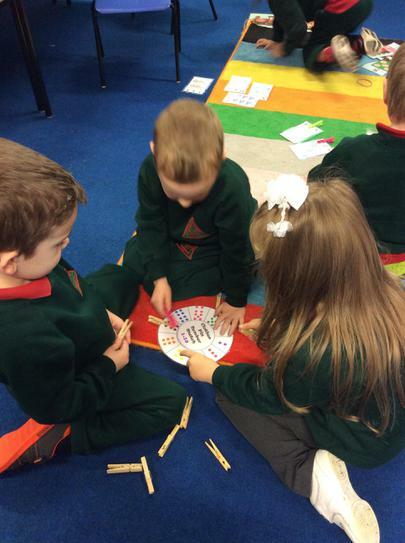 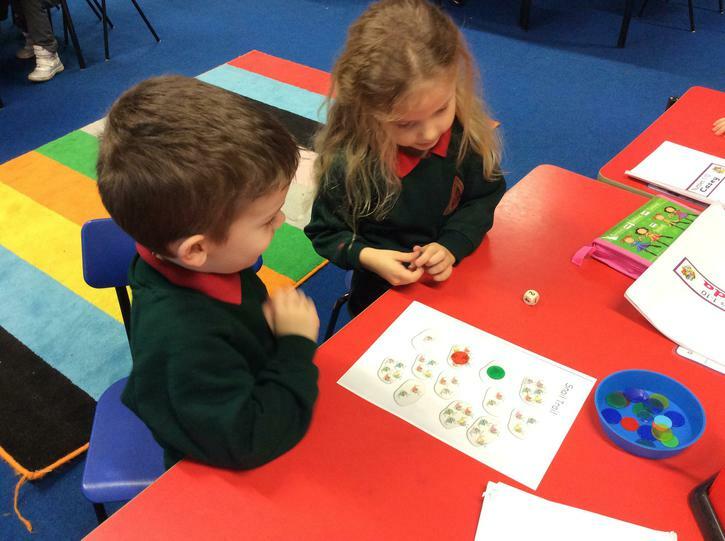 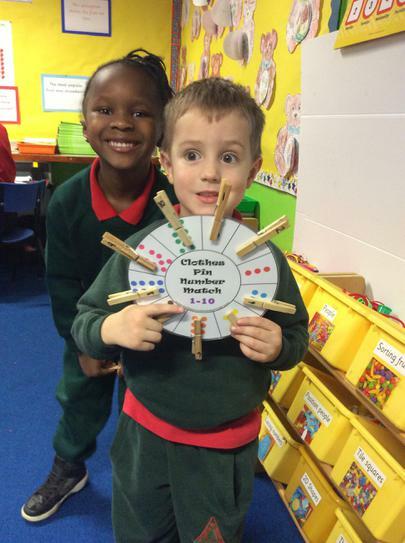 We have been playing lots of fun maths games to help us with our counting, number recognition and have been trying hard to play with a friend. 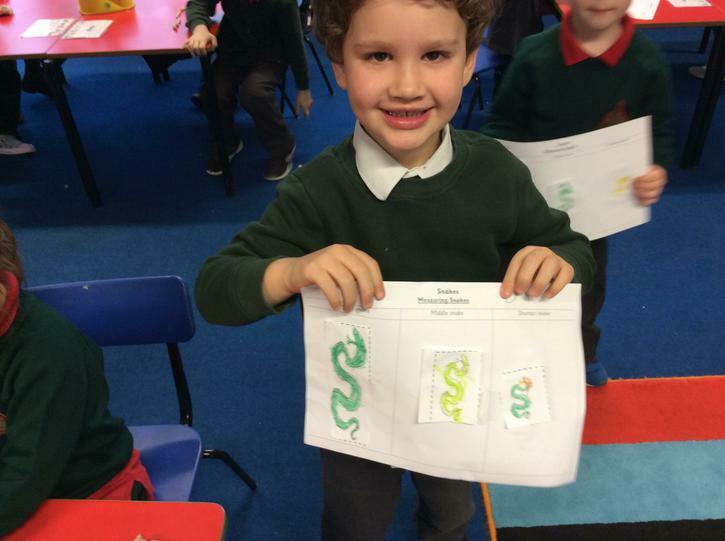 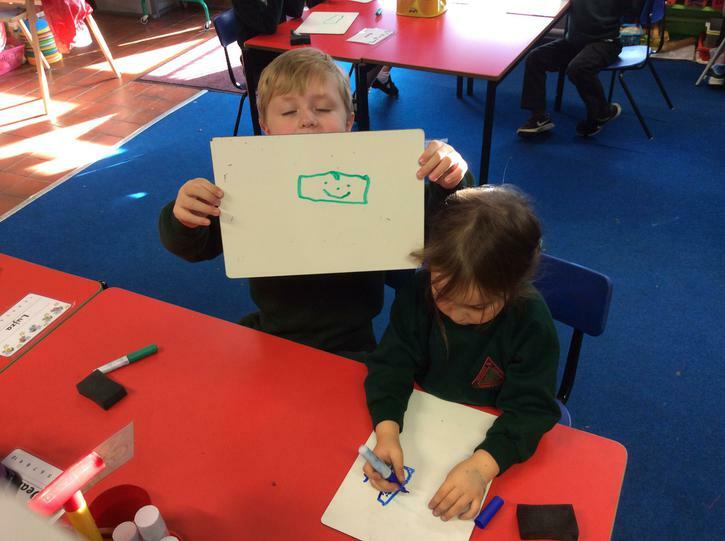 We have also been learning about measure and the correct mathematical language. 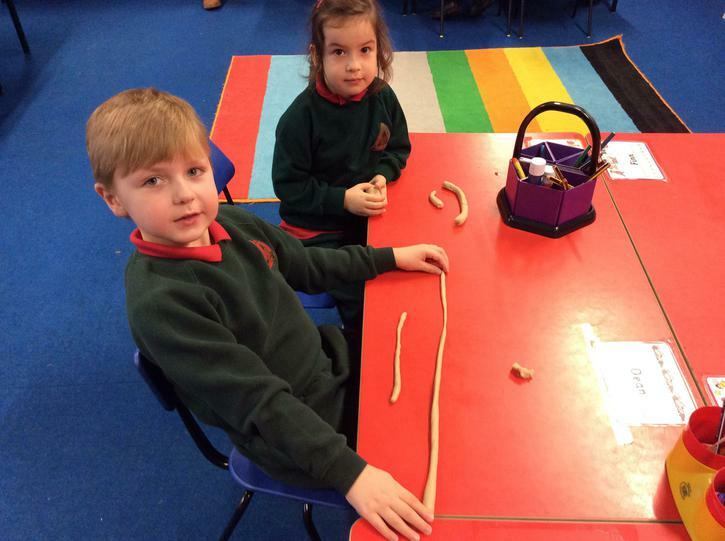 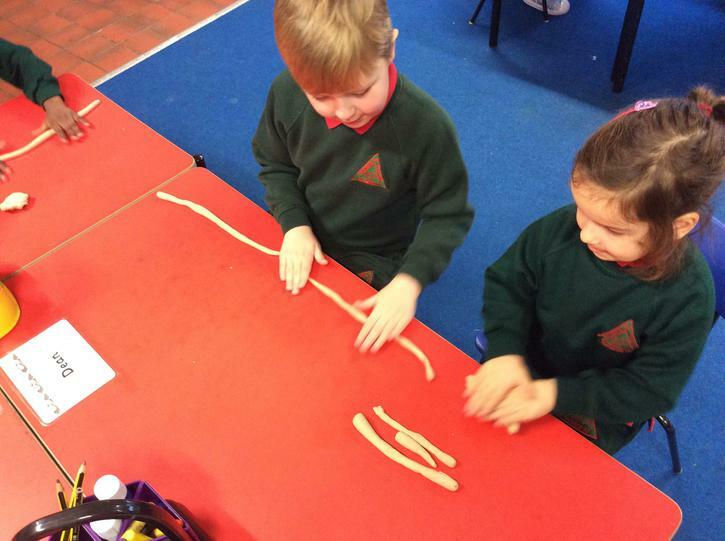 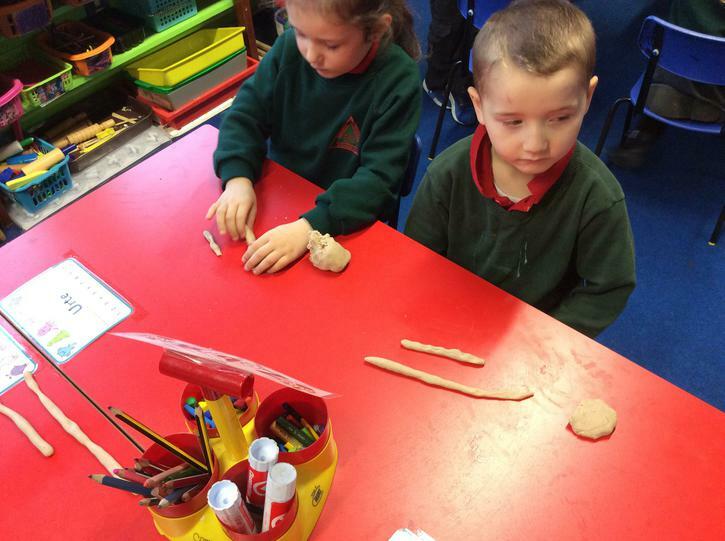 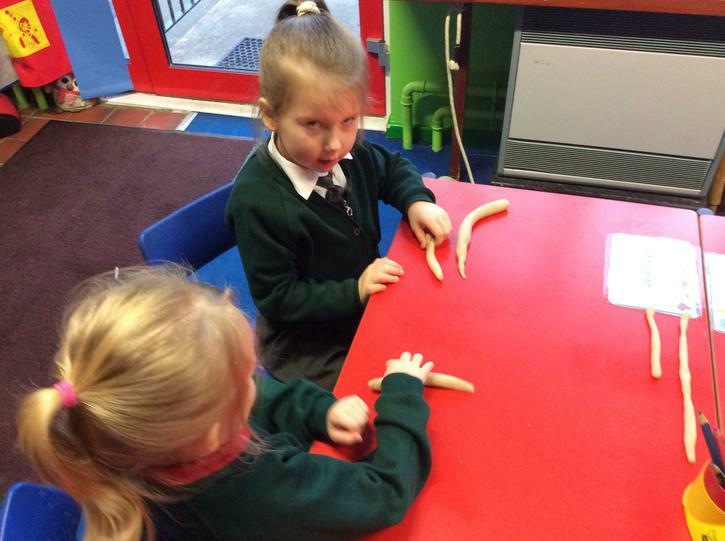 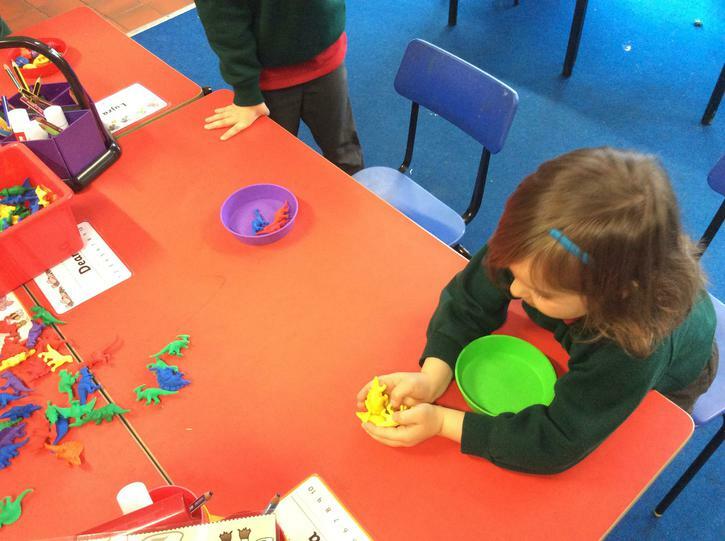 We made snakes from play dough, talked about their length, compared and order them from longest to shortest. 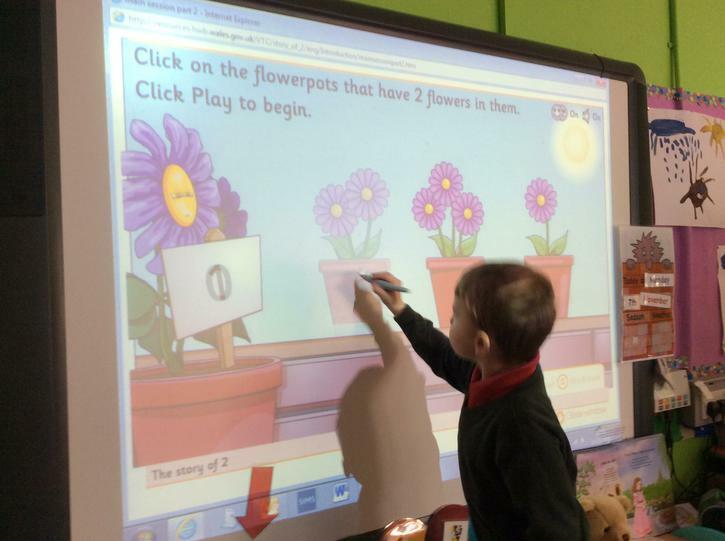 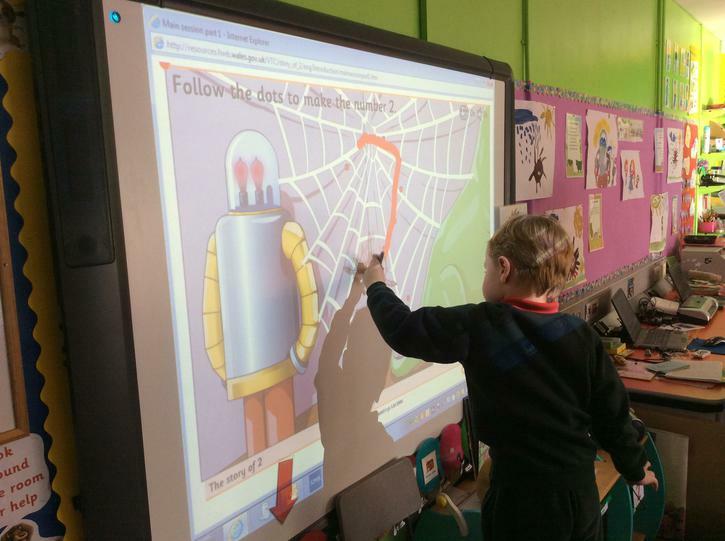 We have also been playing lots of interactive length games on the interactive whiteboard. 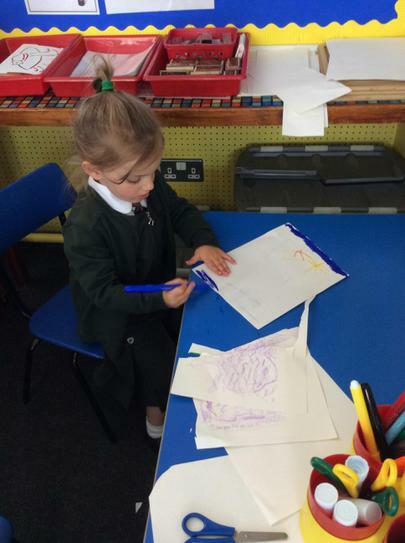 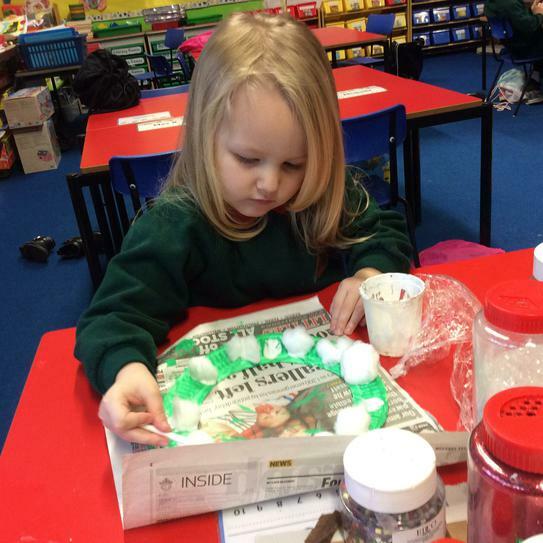 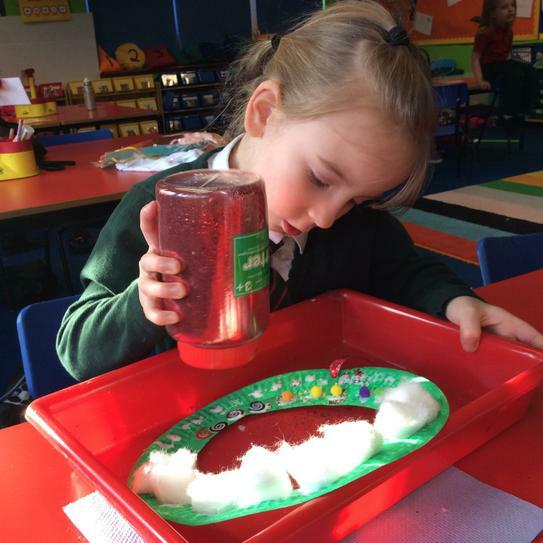 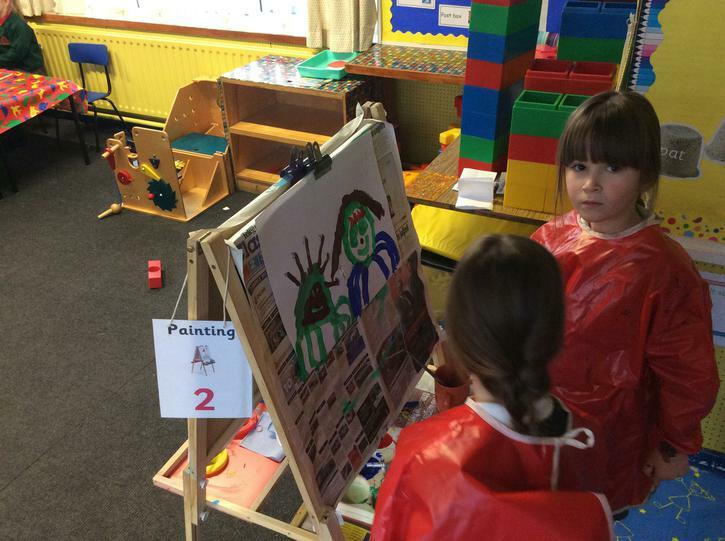 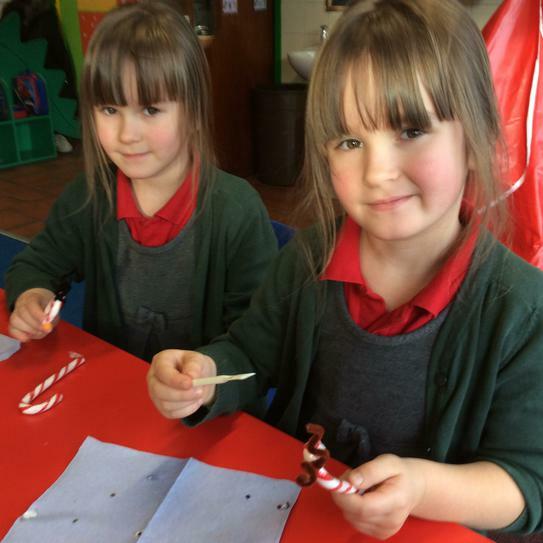 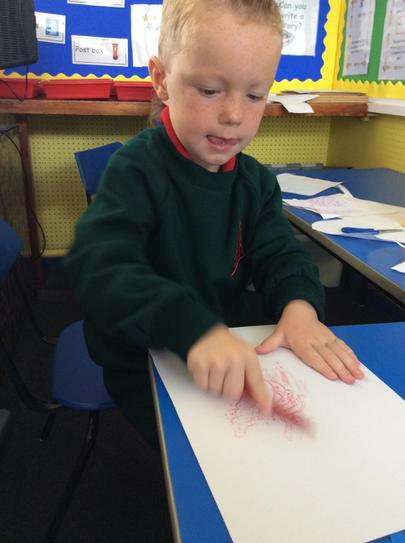 Primary 1 have been getting into the Christmas spirit by engaging in lots of fun Christmas arts, crafts and stories. 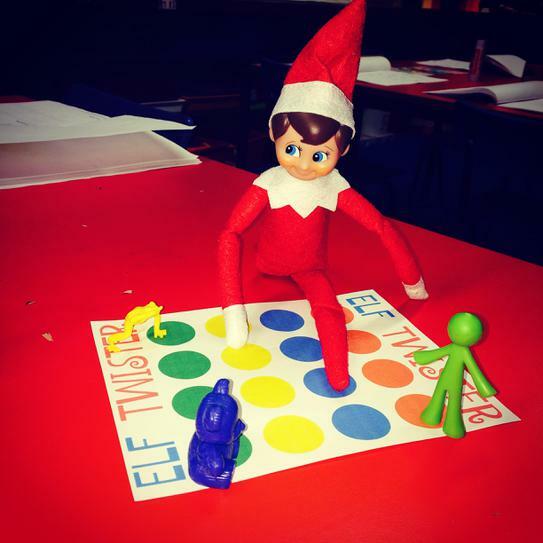 We have been busy making and decorating things to sell at our Christmas craft fair and our little classroom Elf Ernie has been keeping a watchful eye over us. 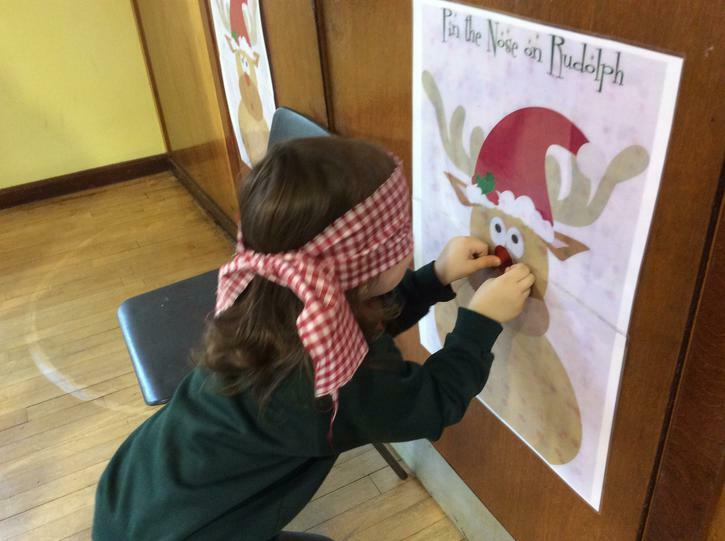 As well as all the lovely stories and games we have been enjoying we have also been learning about the true meaning of Christmas and have been thinking about the traditions that we celebrate this time of year. 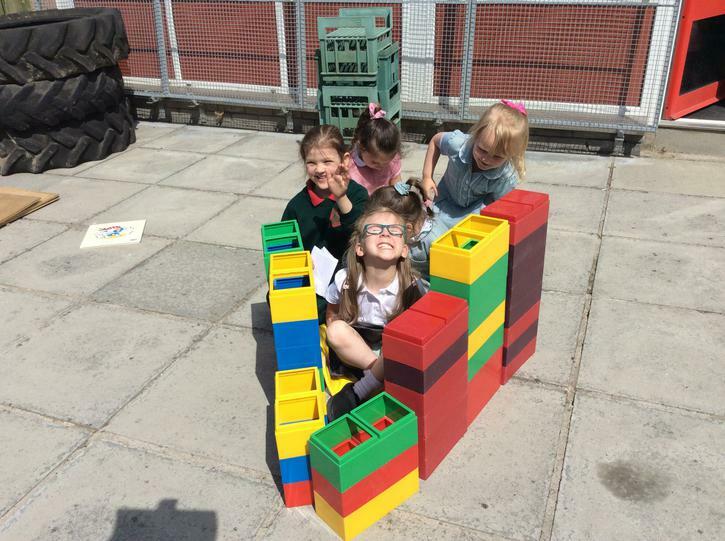 Primary 1 have been learning numbers, shapes and have started to visit our lovely library. 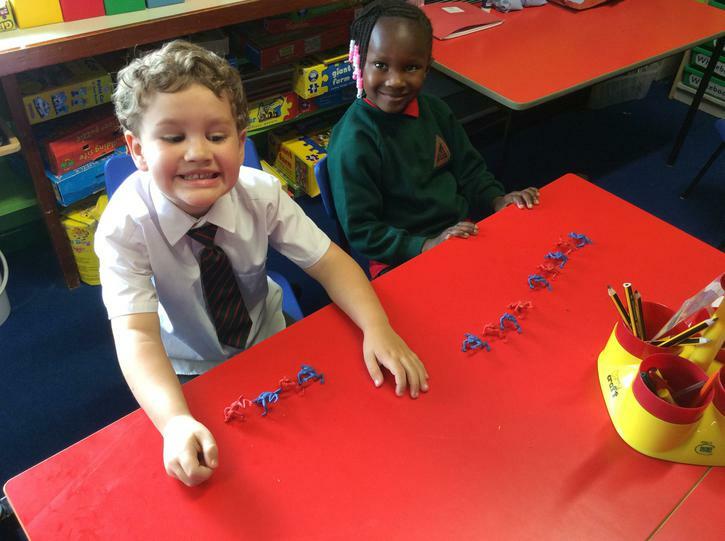 We have been playing lots of fun games to help us with our shape properties and we are even learning how to write number names! 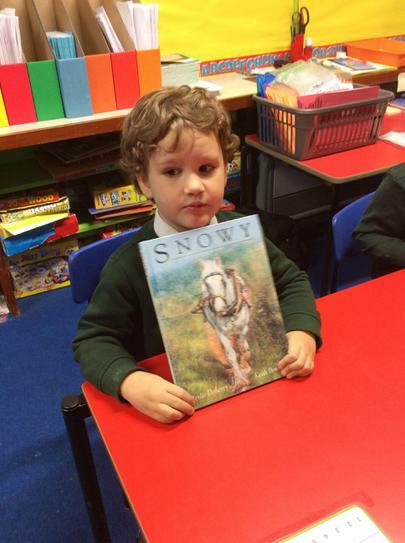 Every Friday we visit the library and get to choose a knew book to look at and read. 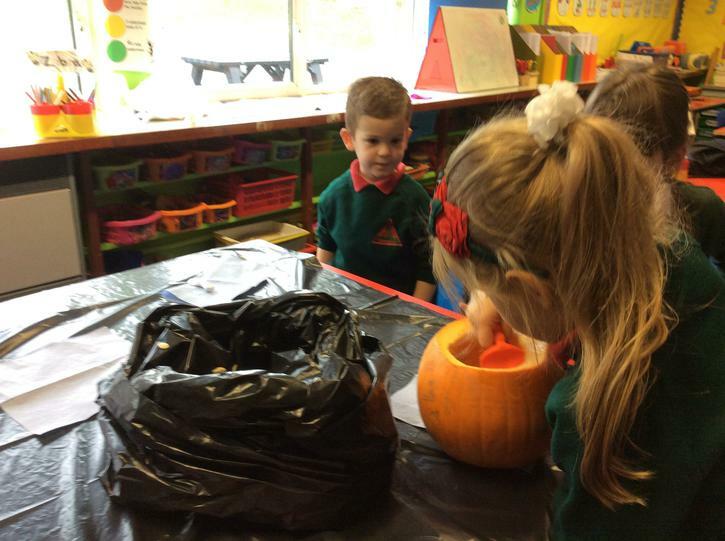 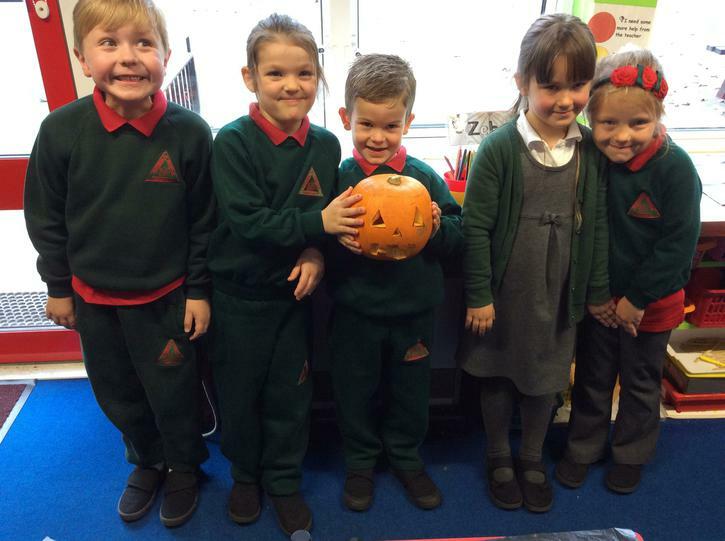 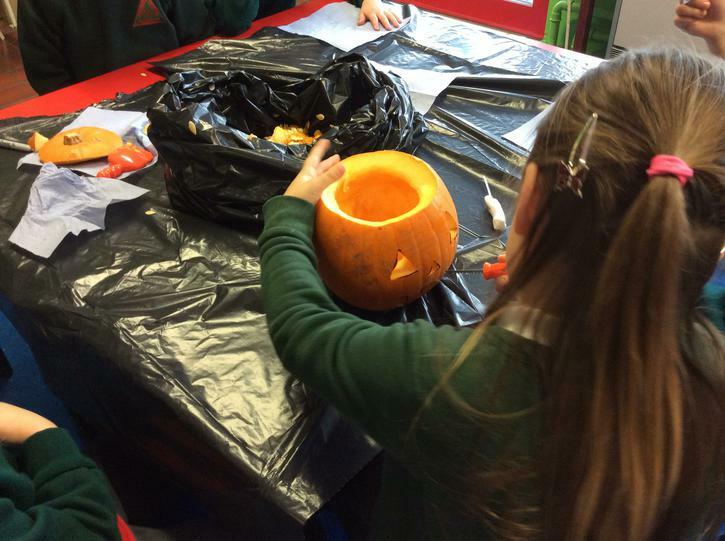 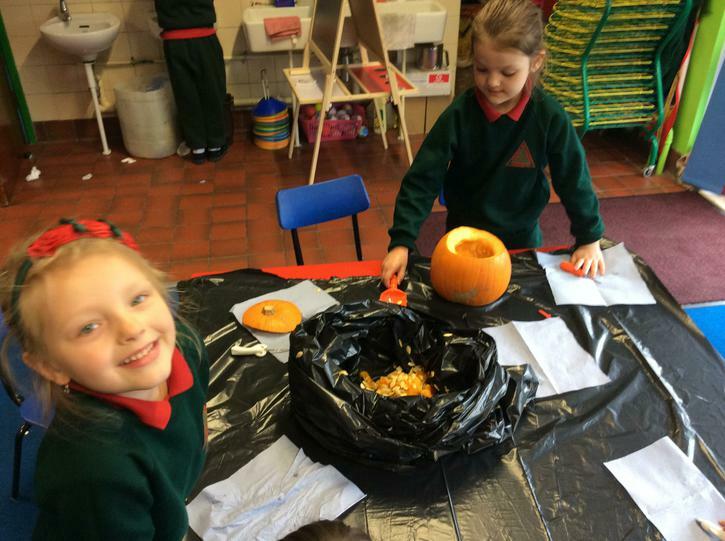 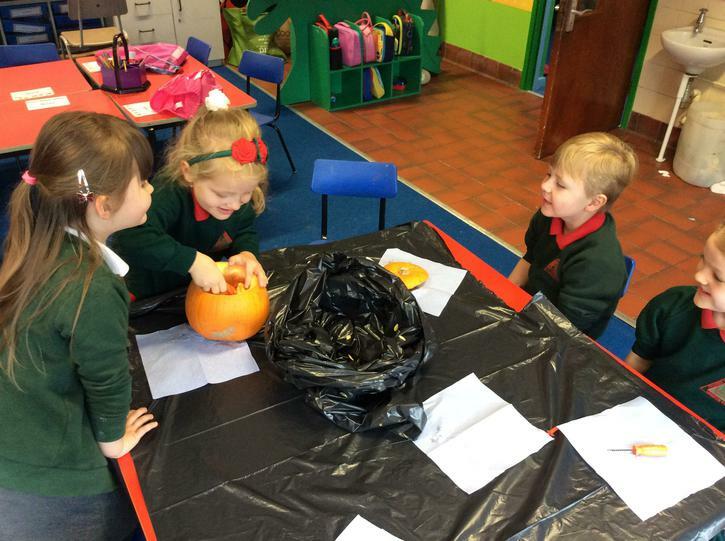 We have being getting into the spirit of Halloween by drawing pumpkins with chalk and carving a real pumpkin! 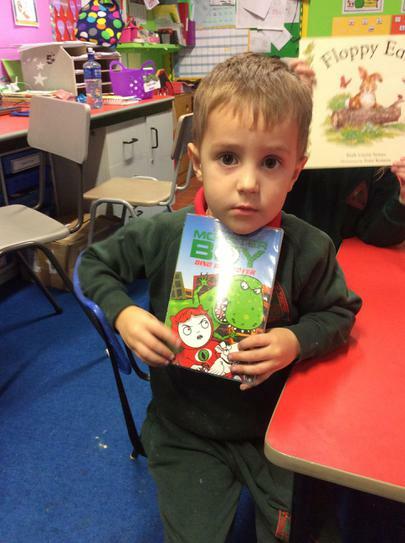 The Book Fair has been in school and Primary 1 went to browse the shelves. 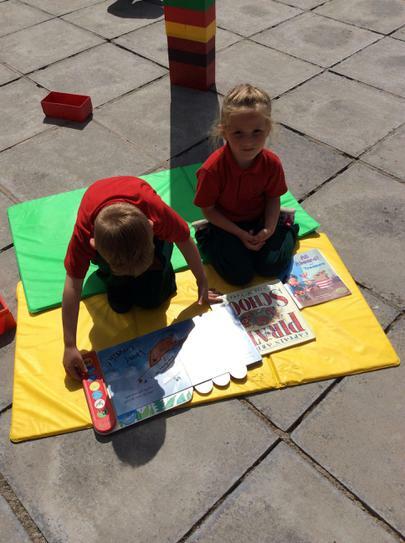 We saw lots of great books and had a chance to choose a few to look at on our own. 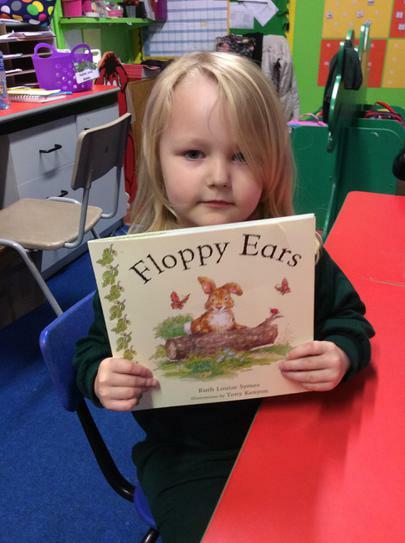 We were really well behaved and were gentle with the books so Mrs Hughes chose a story to read to us. 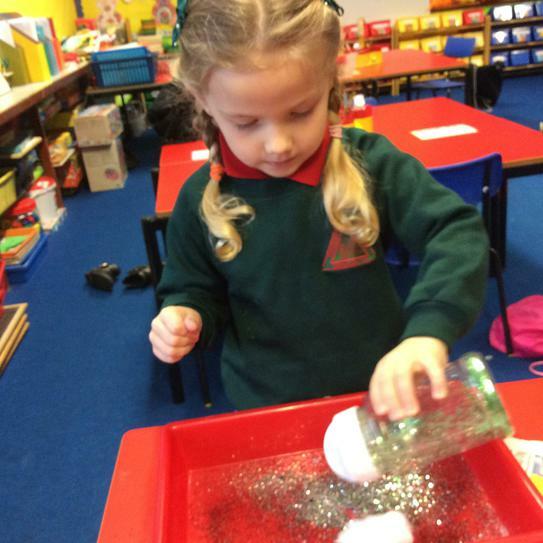 We have been sorting lots of different things in class and are now whizz kids! 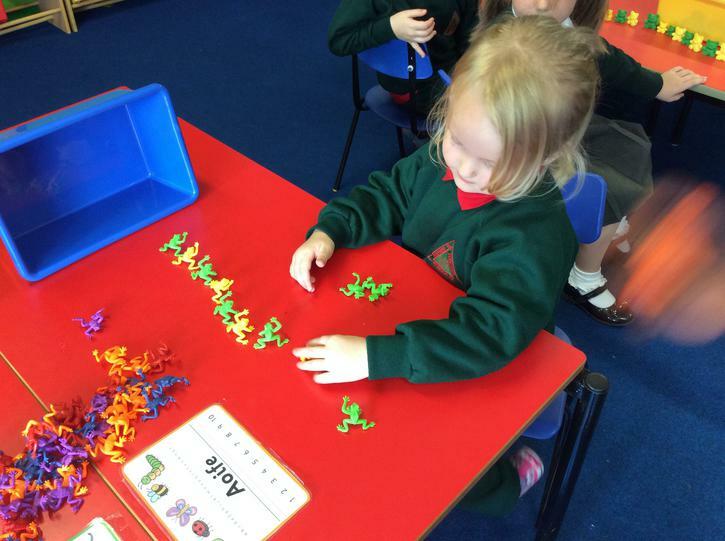 We can sort for colour, size and type. 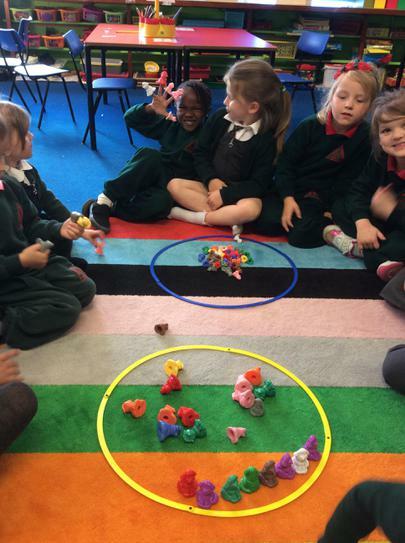 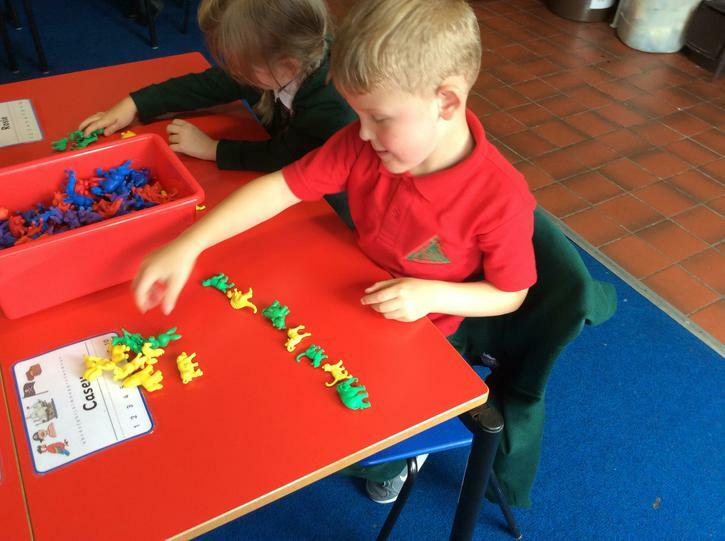 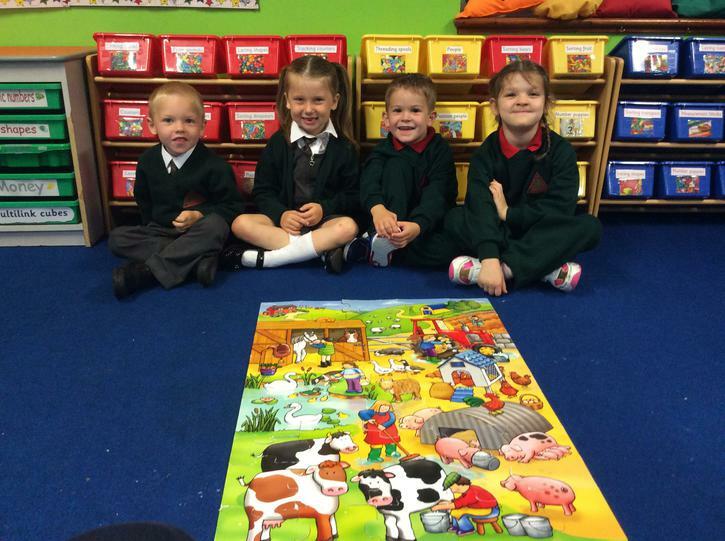 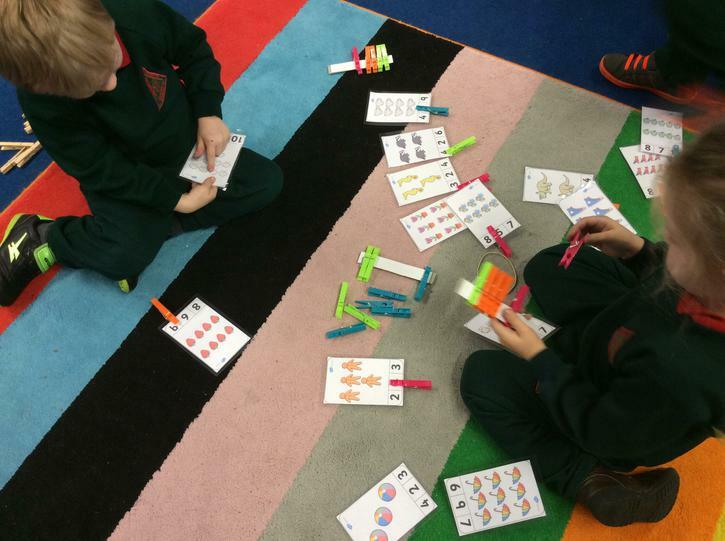 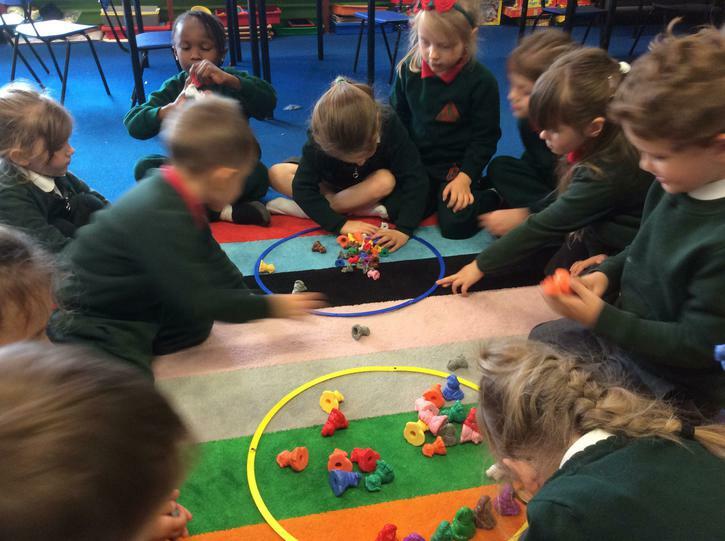 The boys and girls worked with a partner and were able to think of their own ways to sort different items. 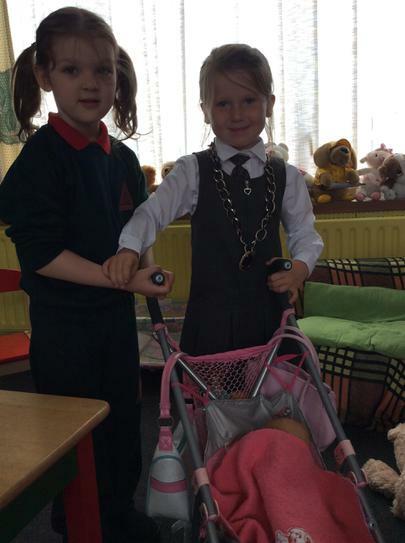 We had some very special visitors in school to tell us all about being safe at home. 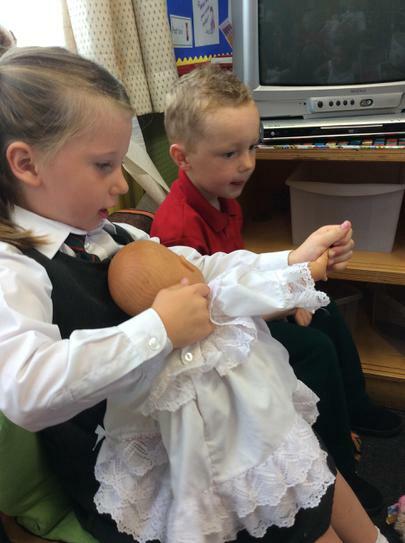 Alex and Connie from the Home Safety Puppetshow came in to tell us some stories. 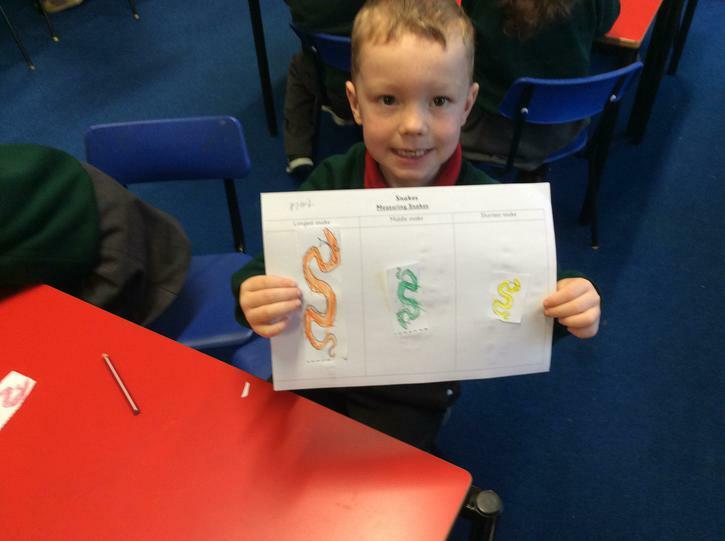 We learned about poisoning, choking and how to stay safe around dogs. 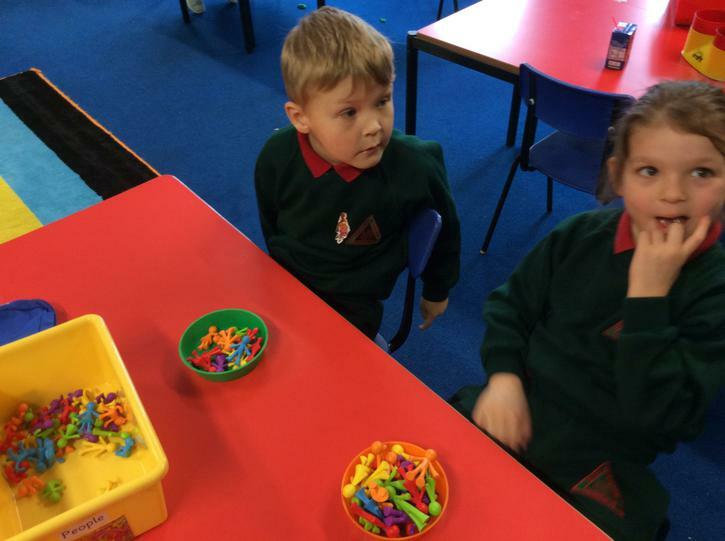 We listened really carefully and now know how to stay safe and be sensible with batteries, when eating and with animals we don't know. 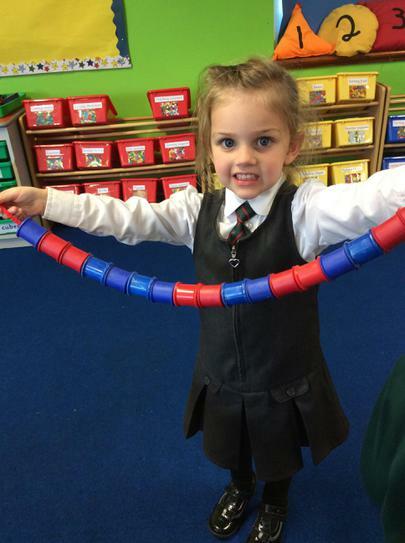 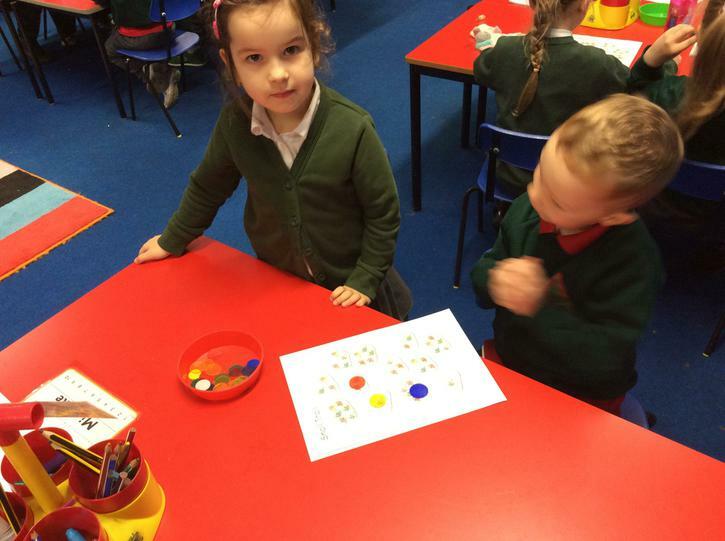 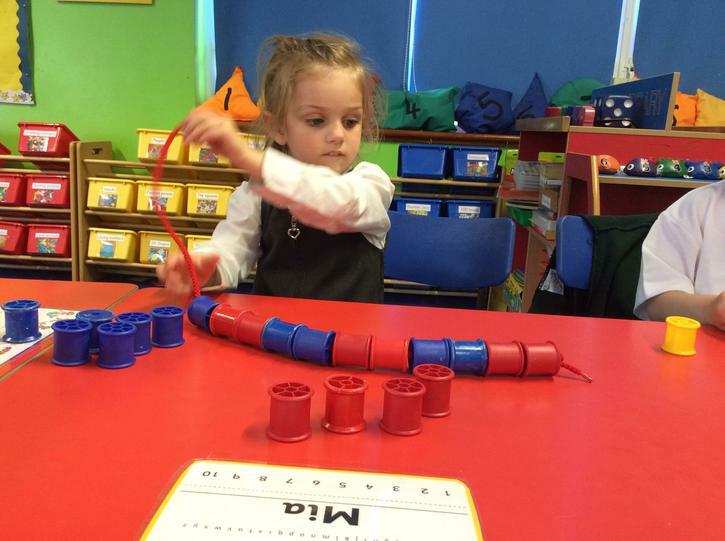 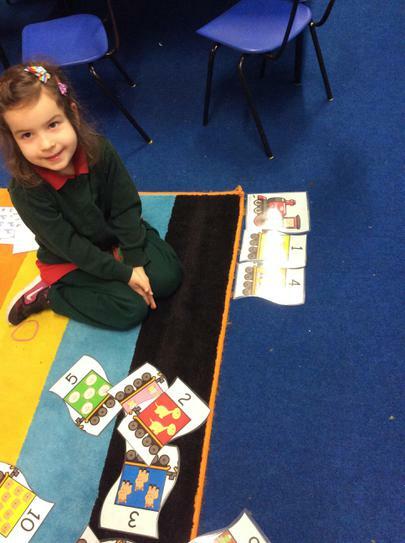 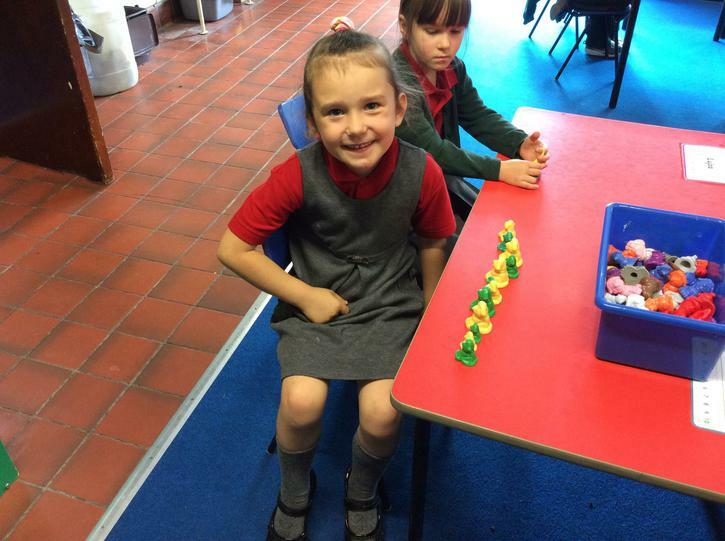 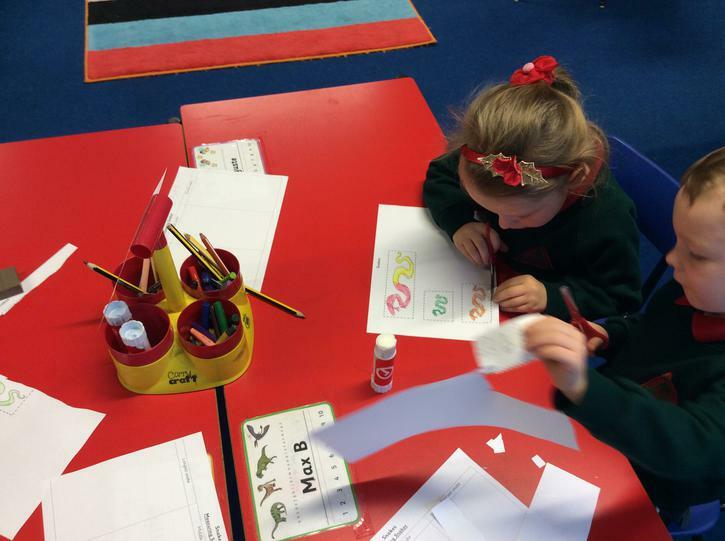 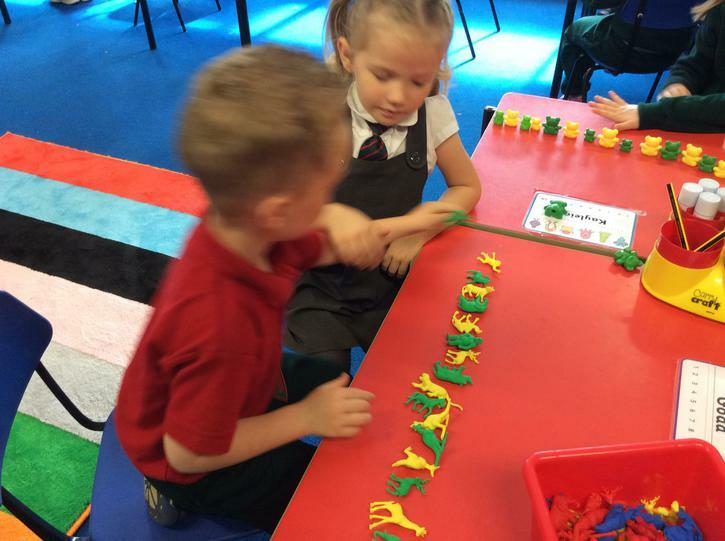 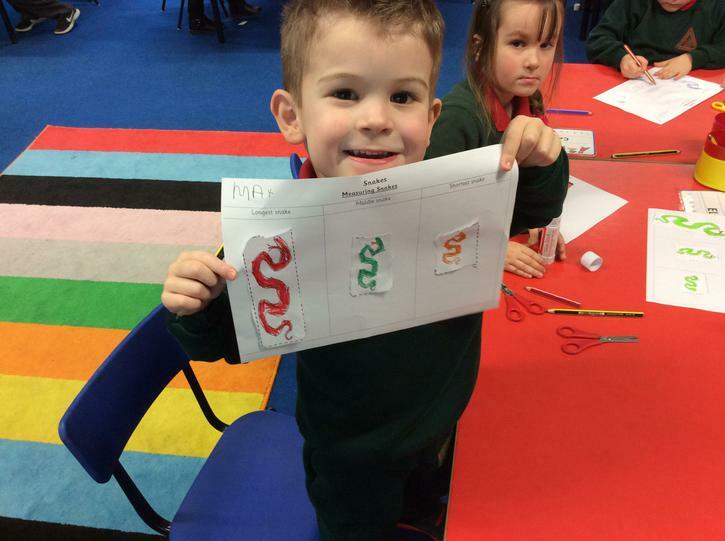 Primary 1 have been busy learning about colours, sorting and making patterns. 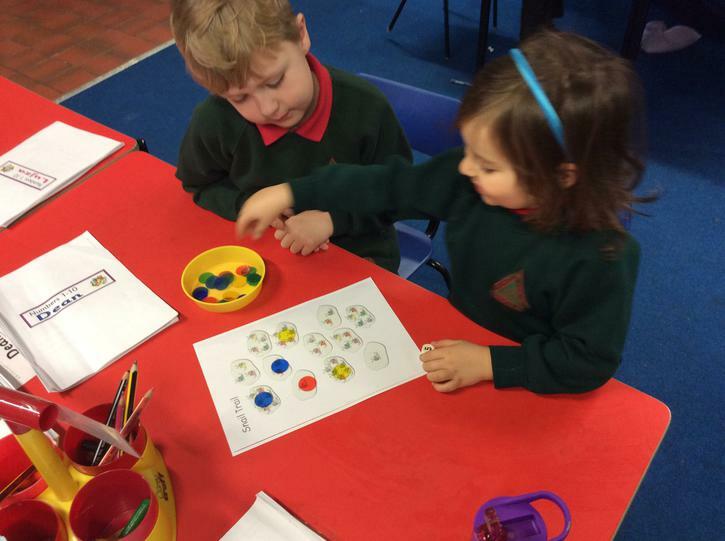 We used lots of different resources to help make patterns with different colours and shapes. 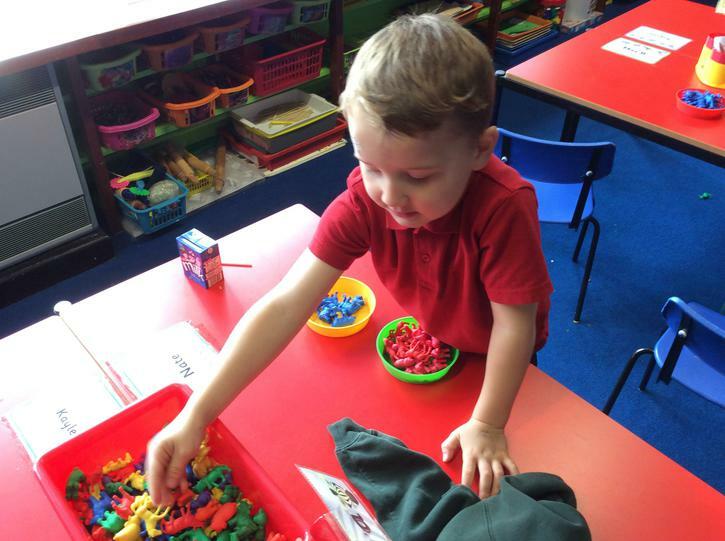 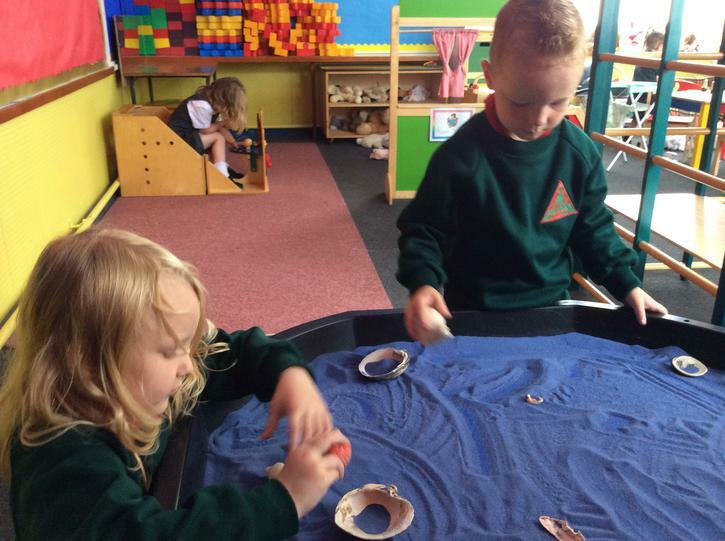 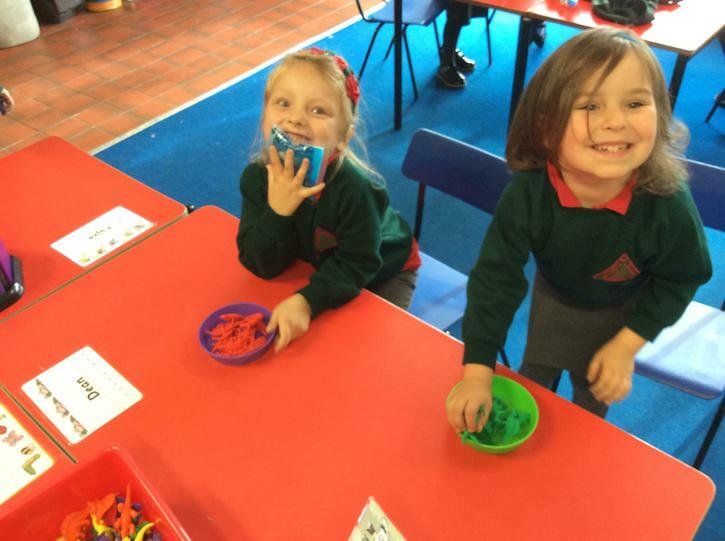 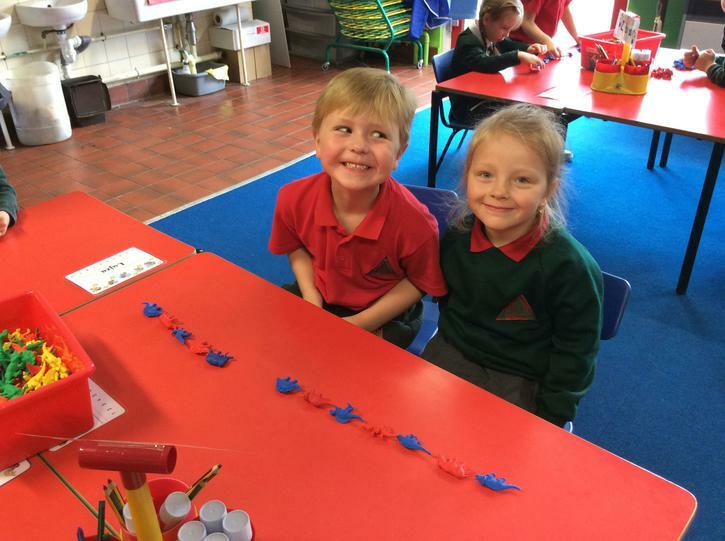 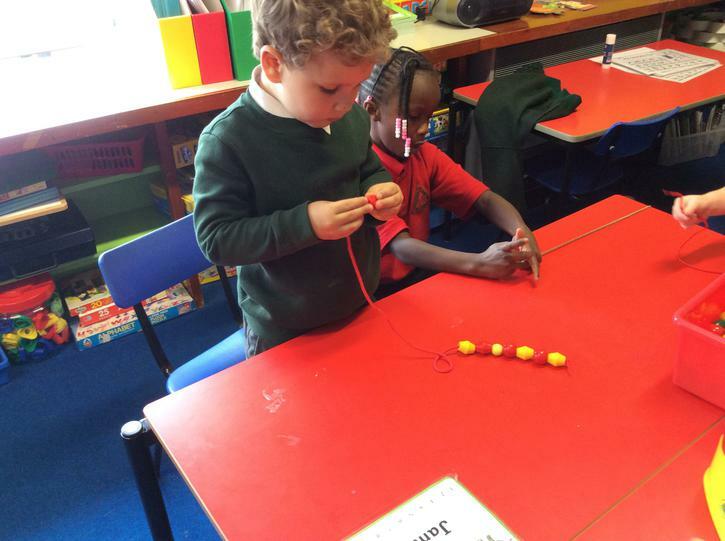 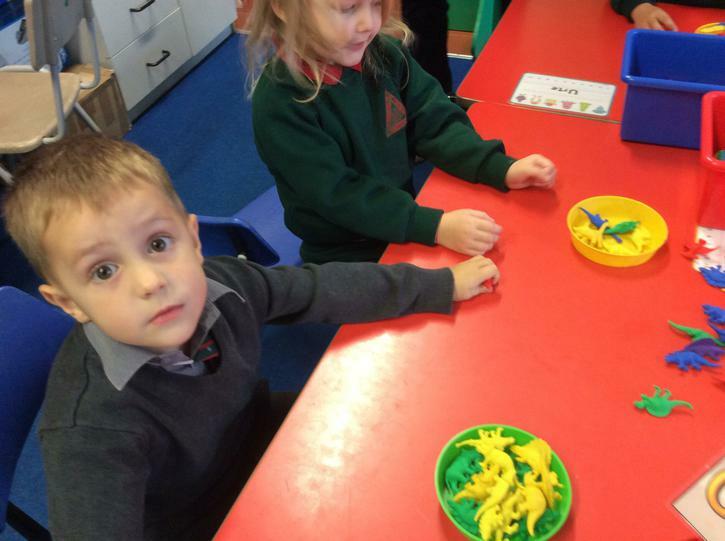 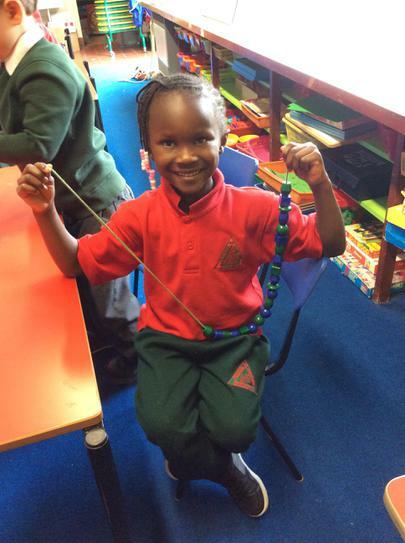 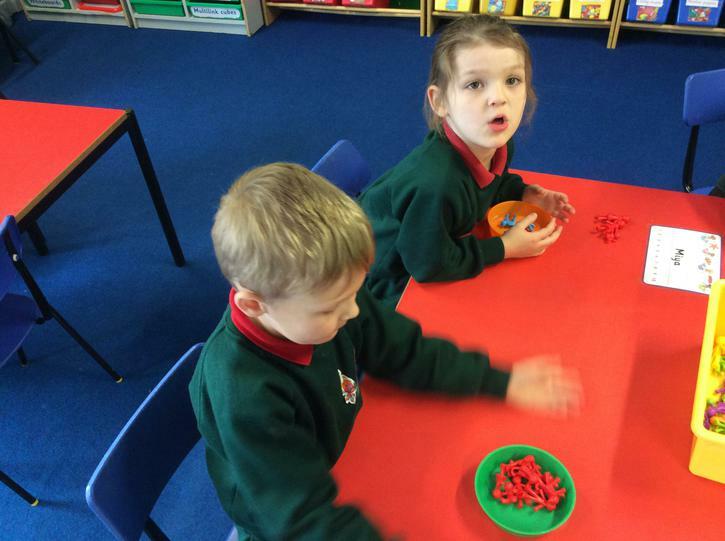 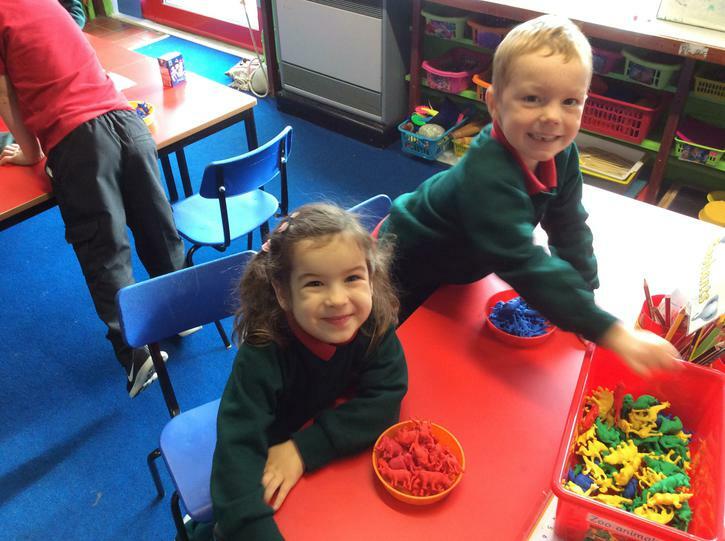 The boys and girls have also been working on their fine motor skills by threading beads and spools to make different patterned necklaces and have sorted objects for colour, type and size. 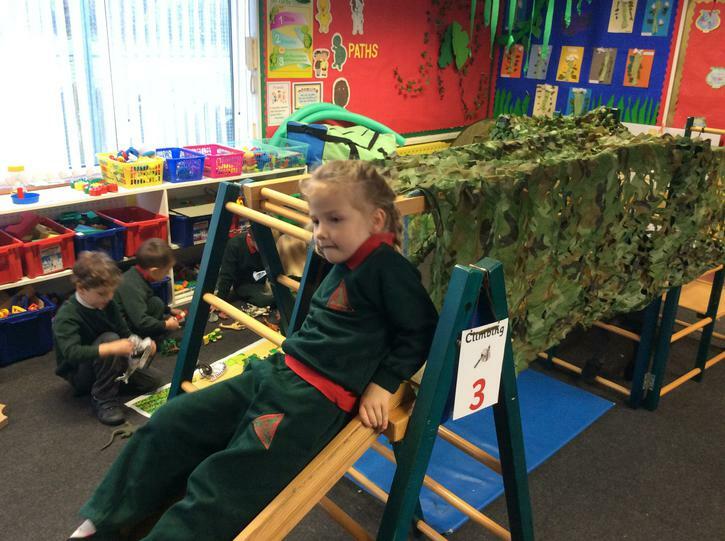 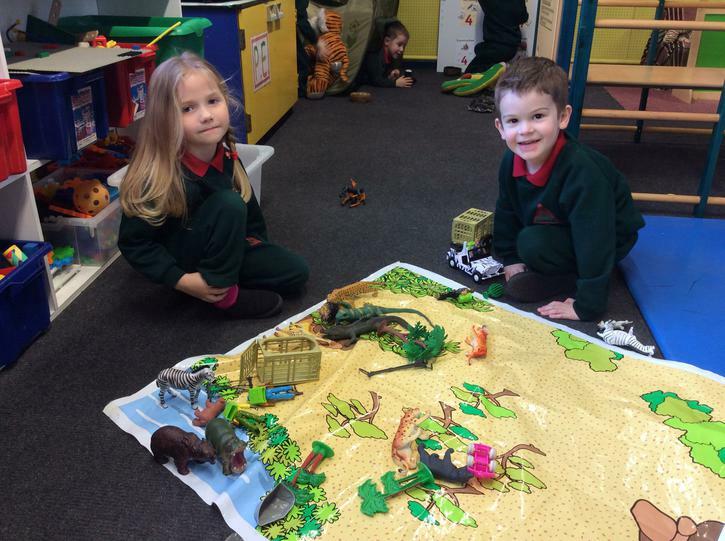 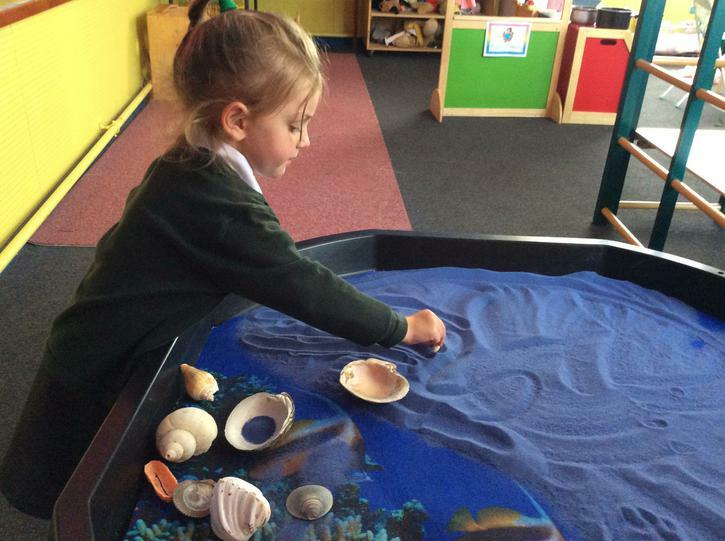 We have been settling into our new classroom and getting used to our surroundings. 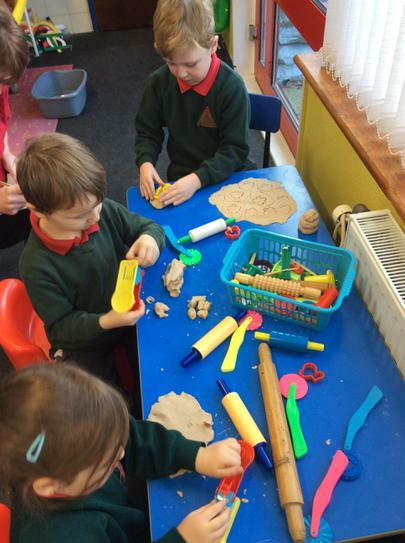 Our first few days have been busy and exciting. 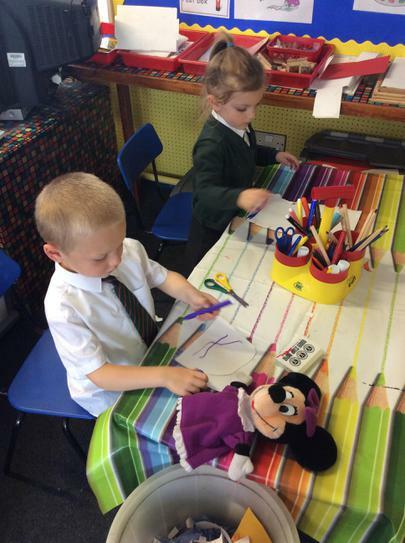 We have been learning new routines, learning our colours and making lovely memories of our first day at school.